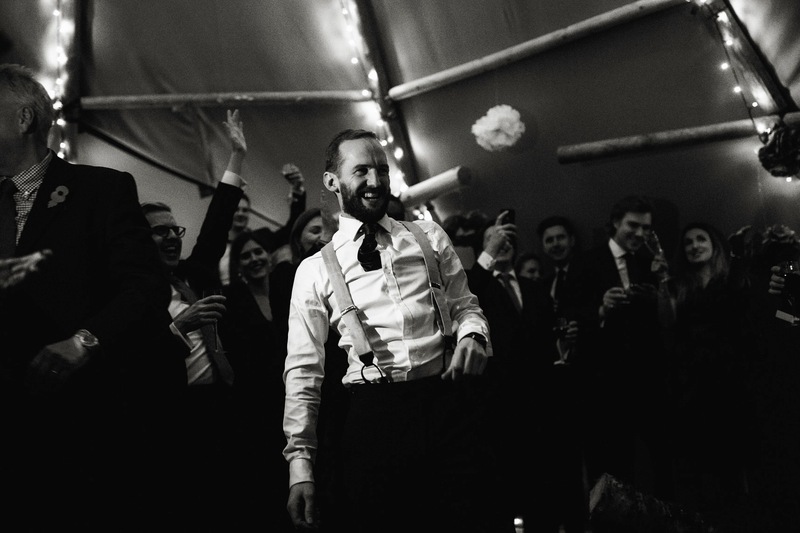 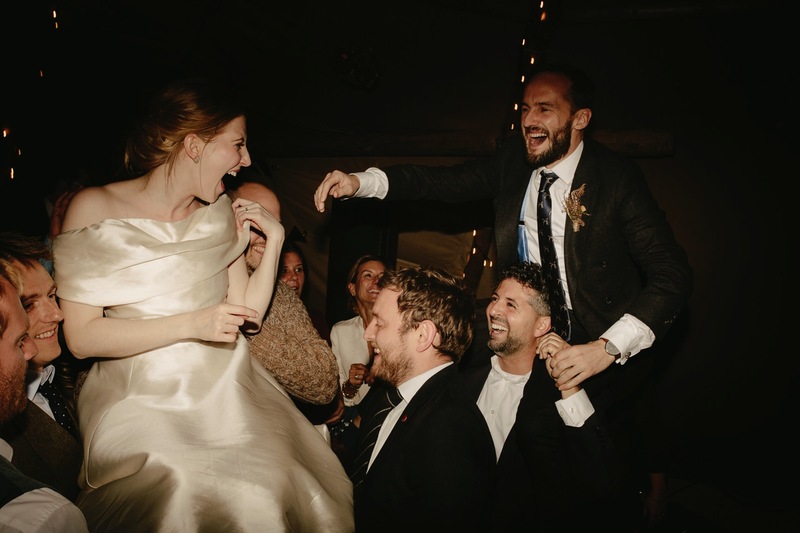 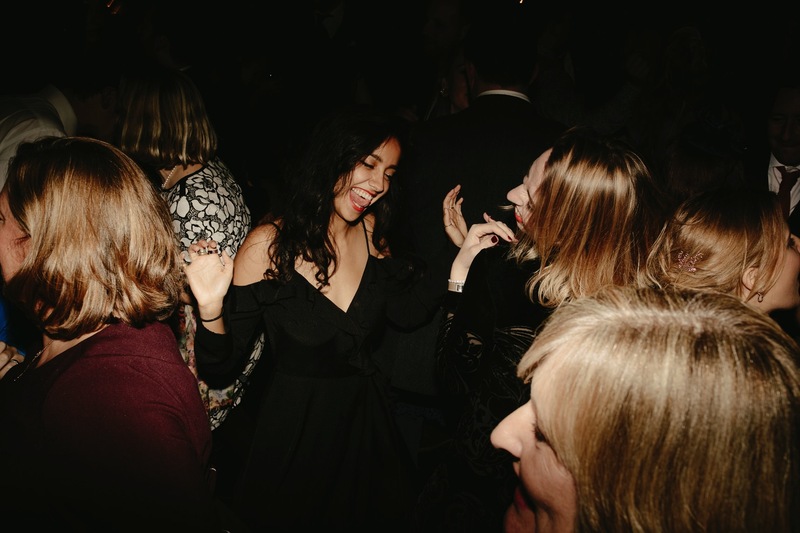 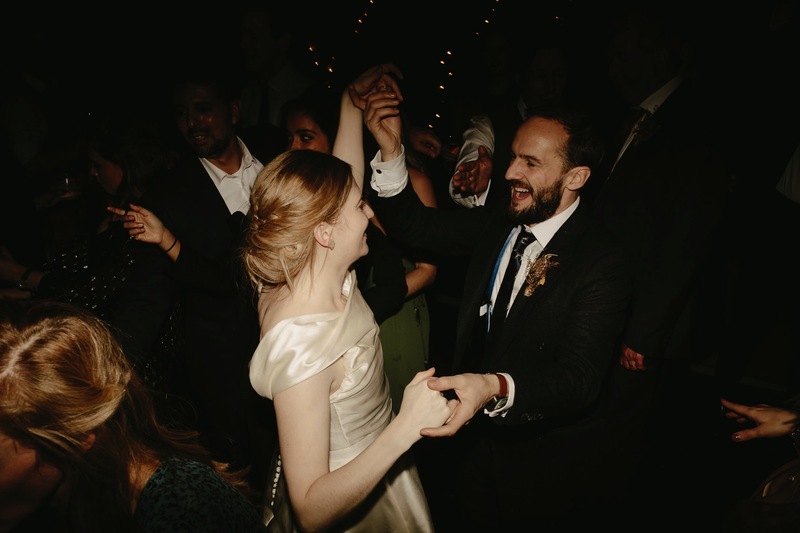 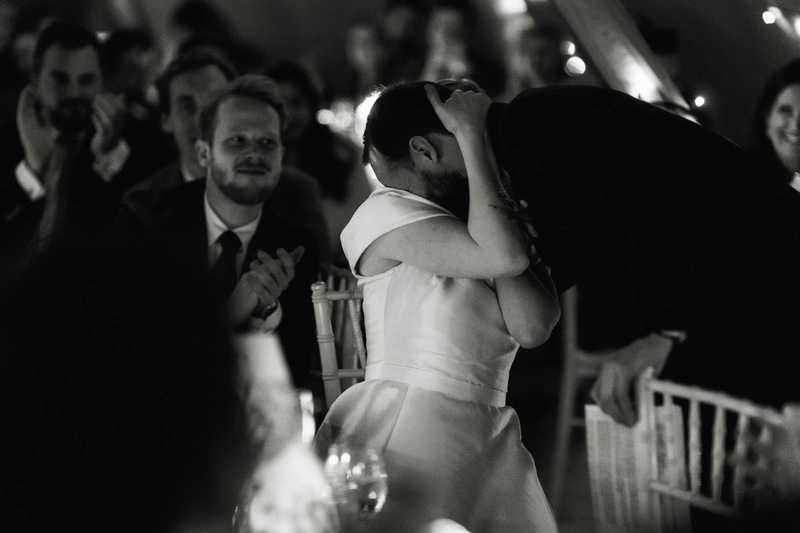 When I met Rob and Charlie in London a few months before their wedding, we clicked instantly. 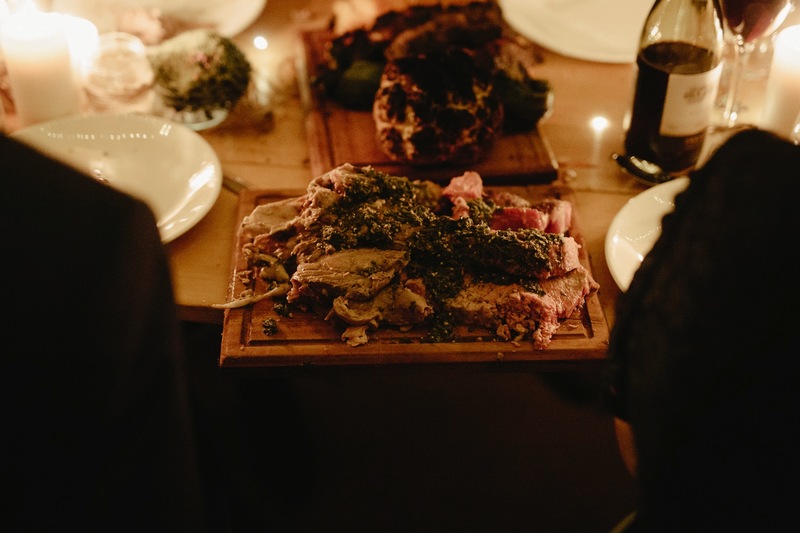 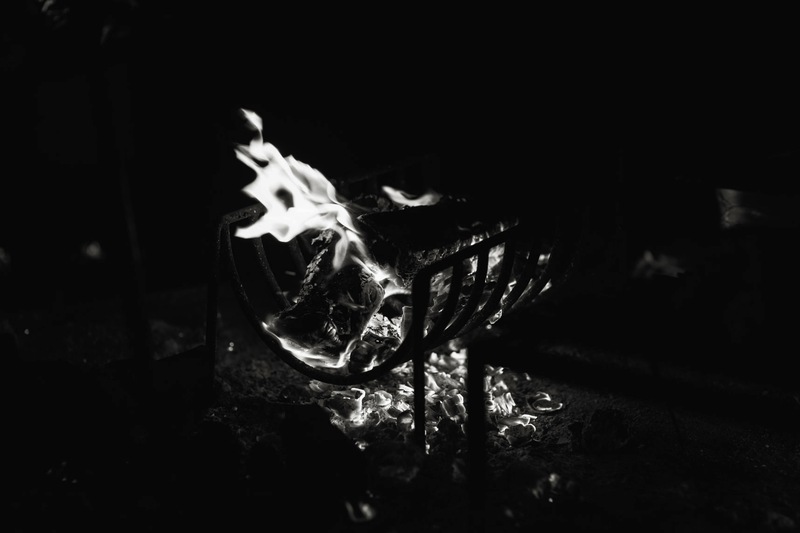 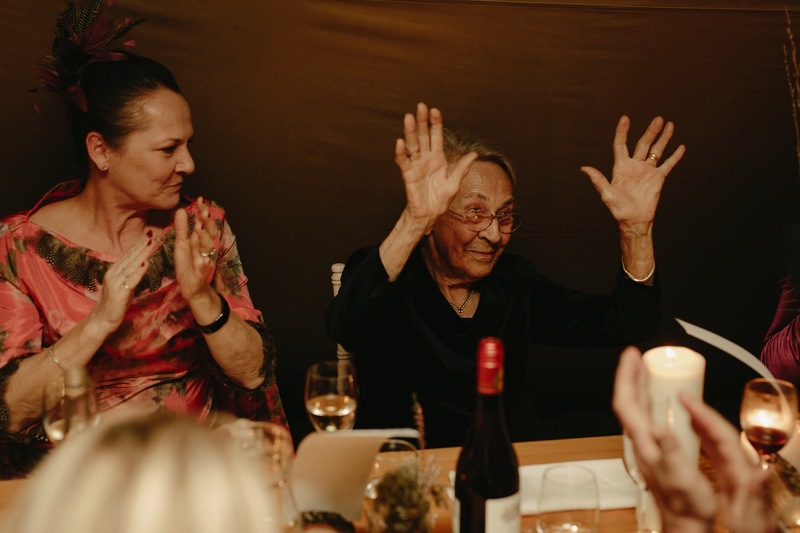 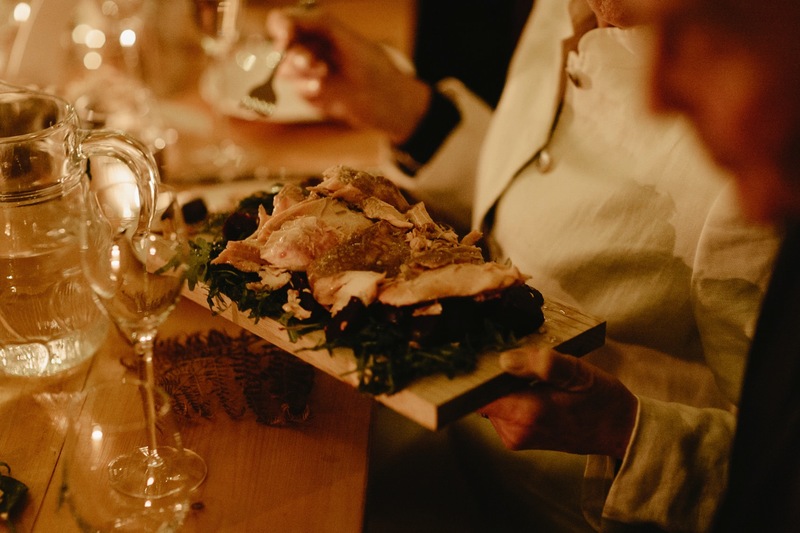 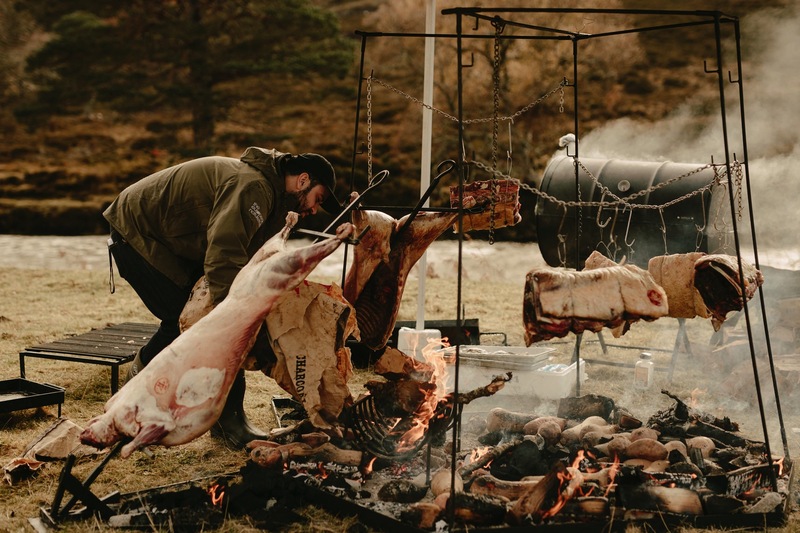 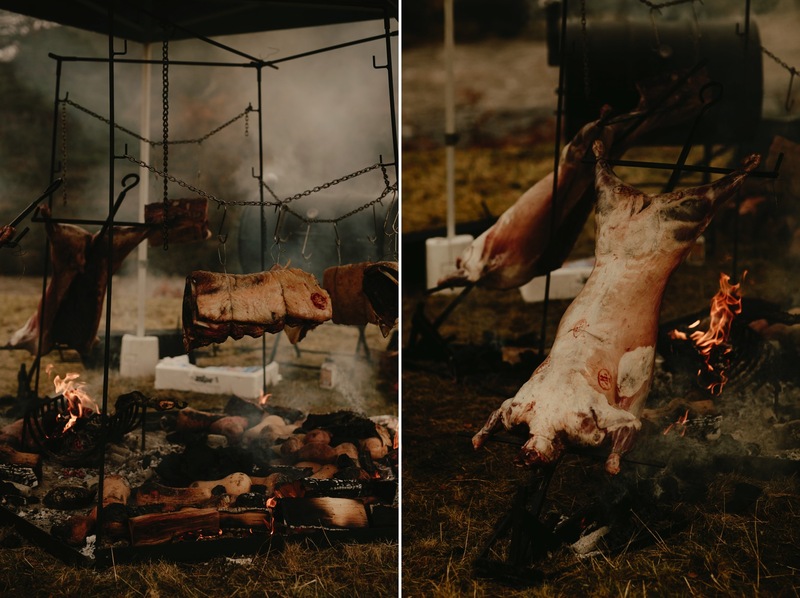 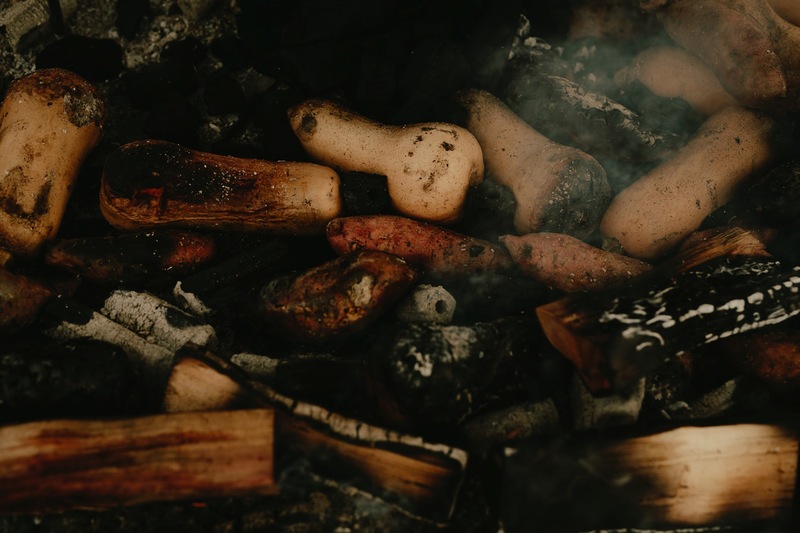 They shared stories of their recent travels through South America and after discovering a mutual love for ‘Chef’s Table’, humbly dropped into the conversation their incredible tale of their 10 day stay on Francis Mallmann’s private island in Patagonia, enjoying the most meals cooked over open coal fires by his team.  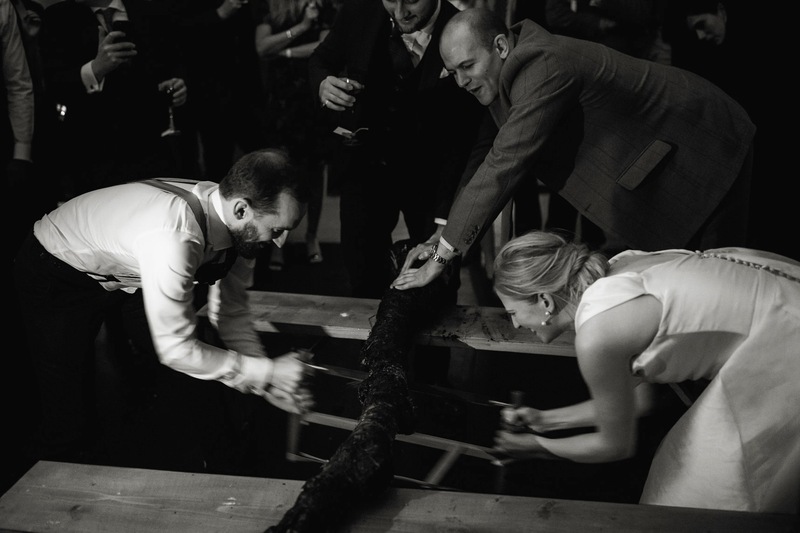 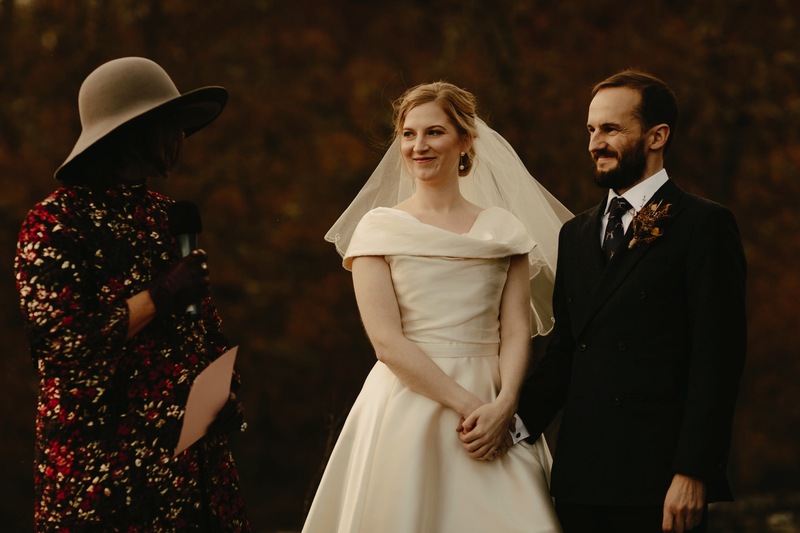 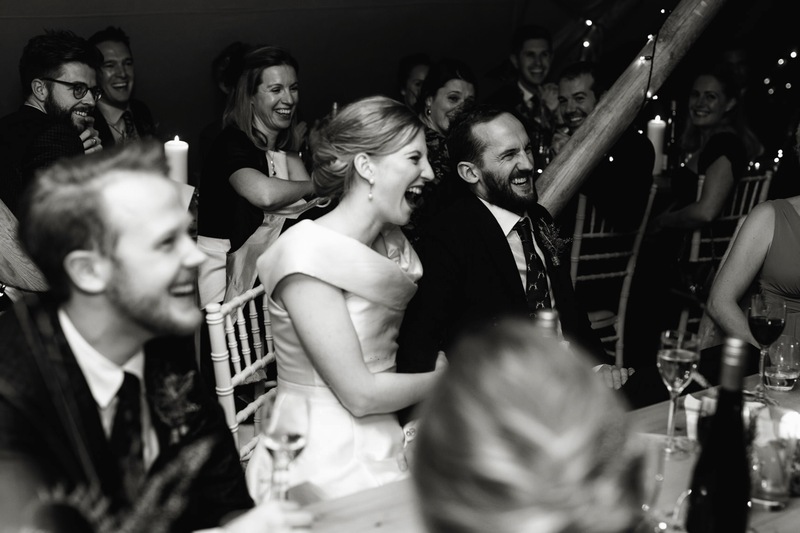 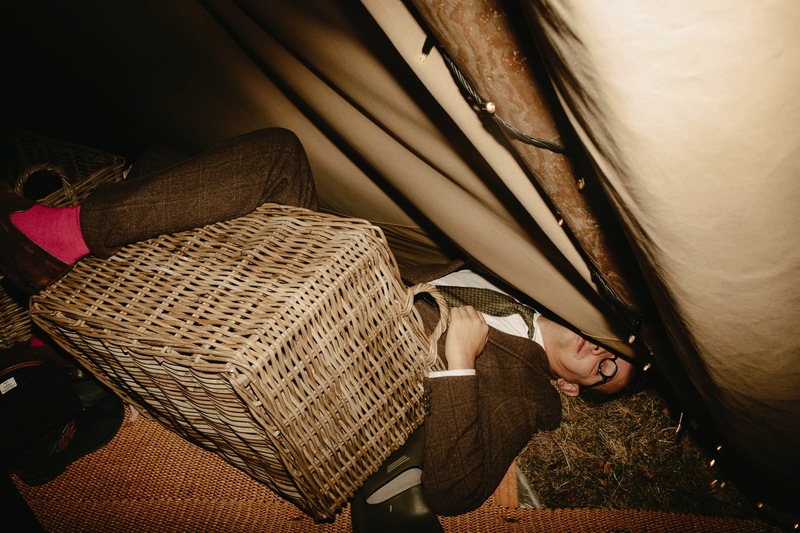 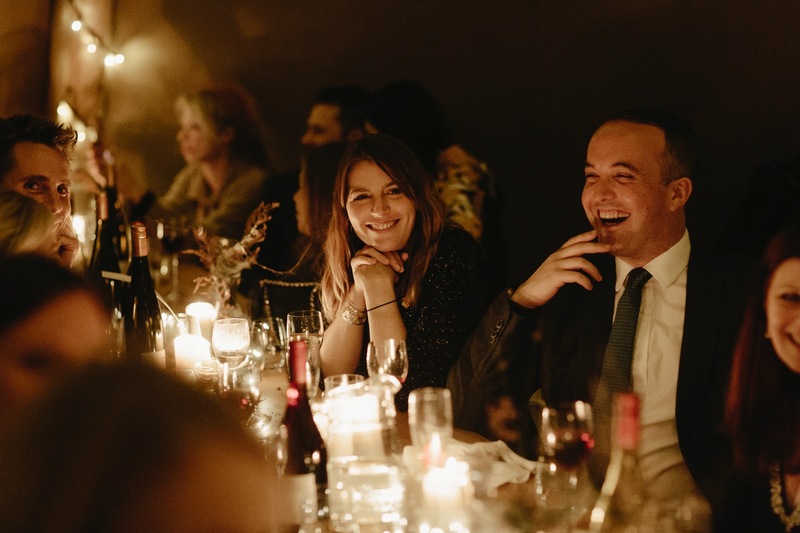 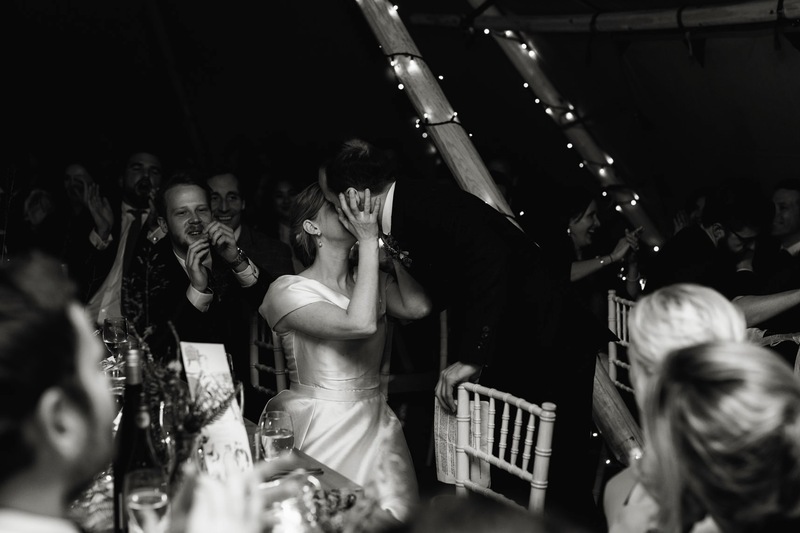 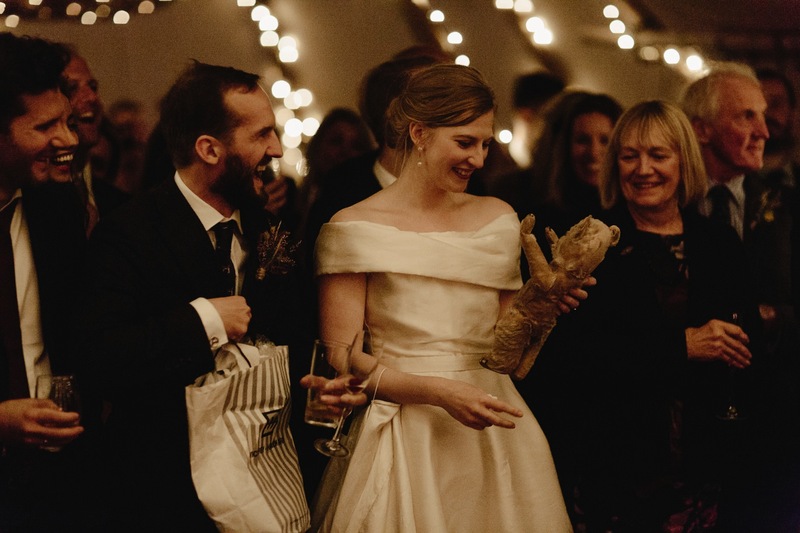 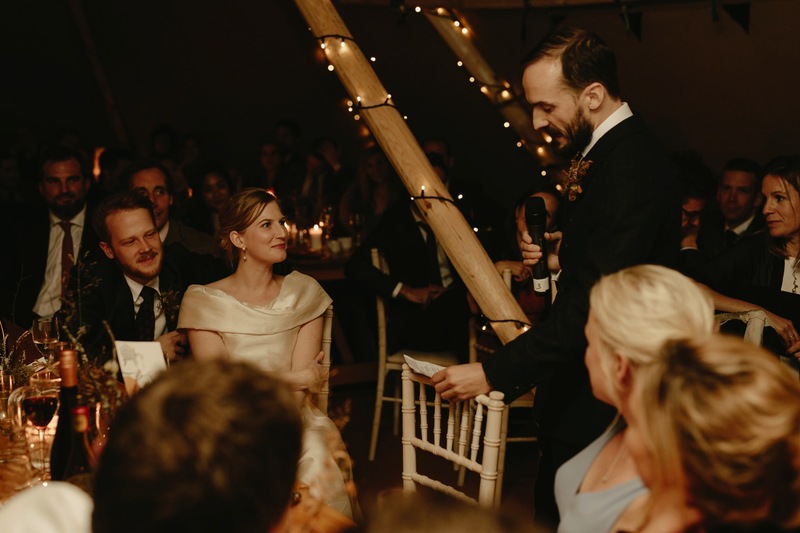 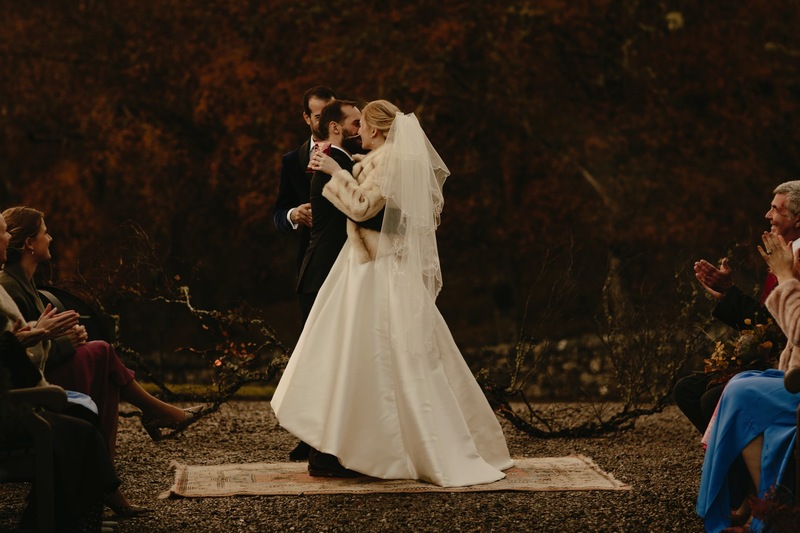 With a love for good food, travel and interiors I knew their wedding would be such a special occasion. 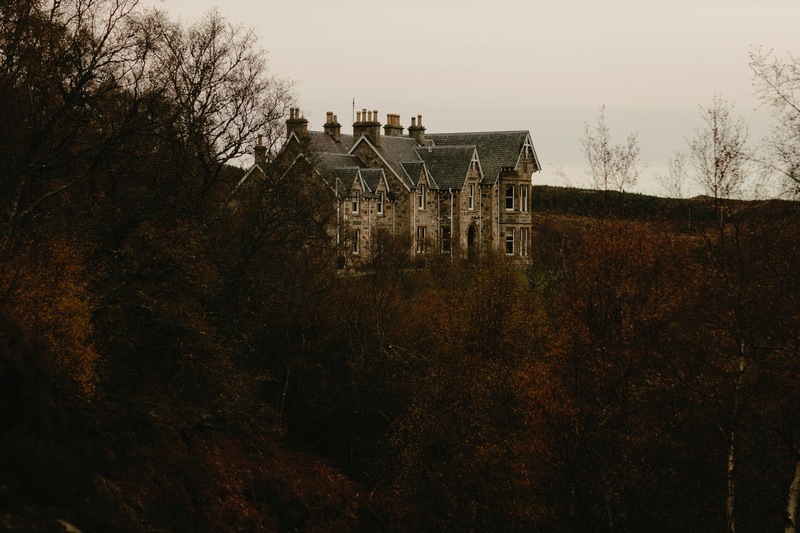 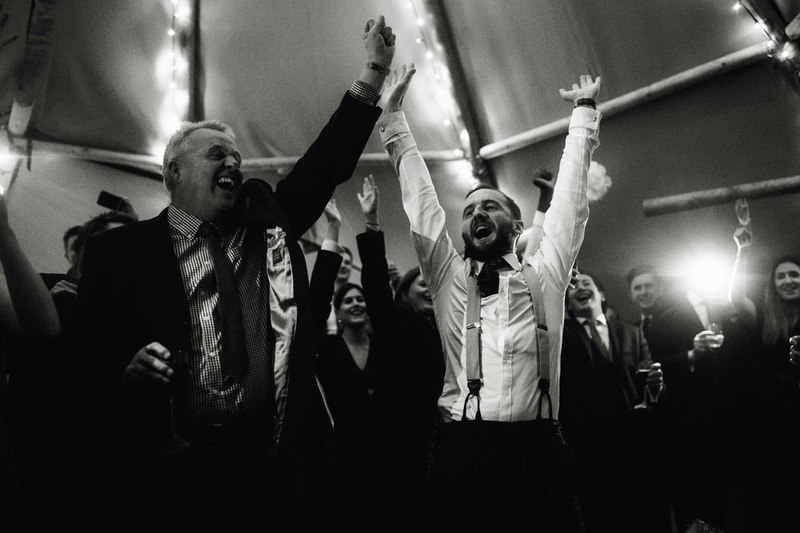 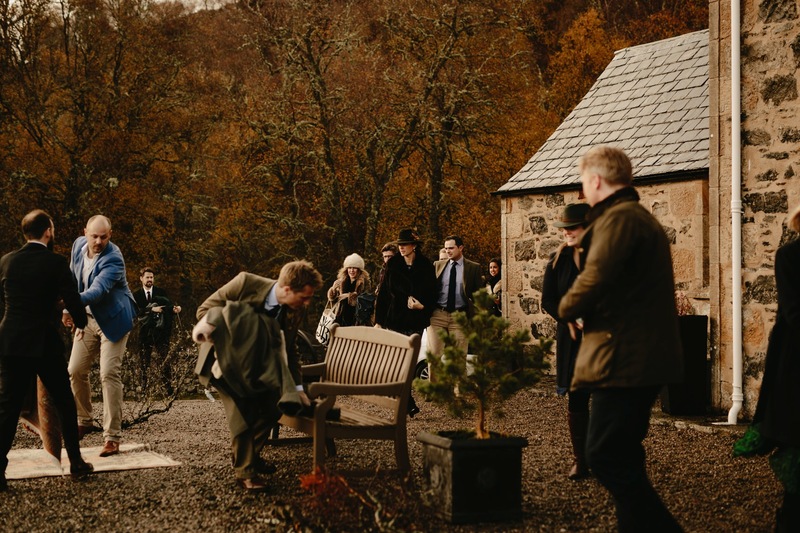 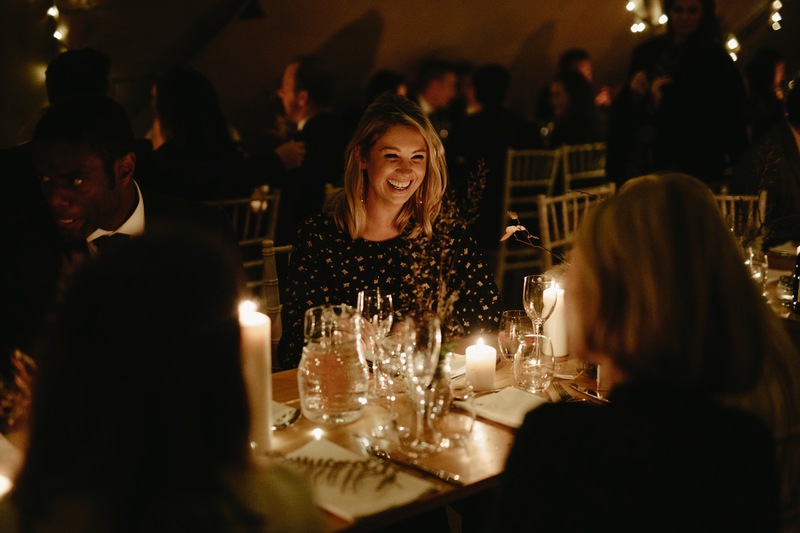 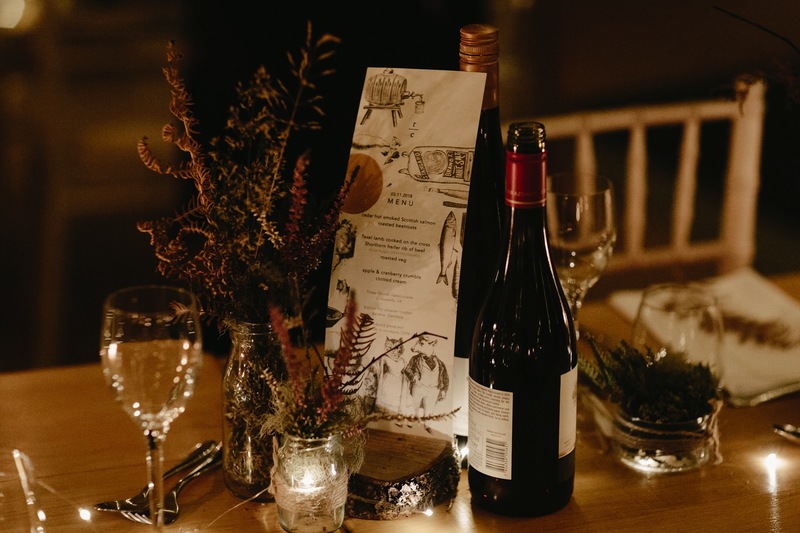 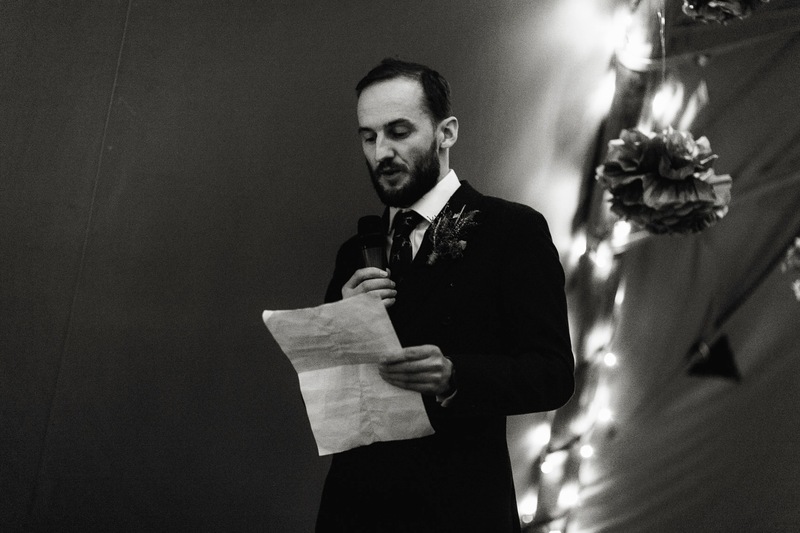 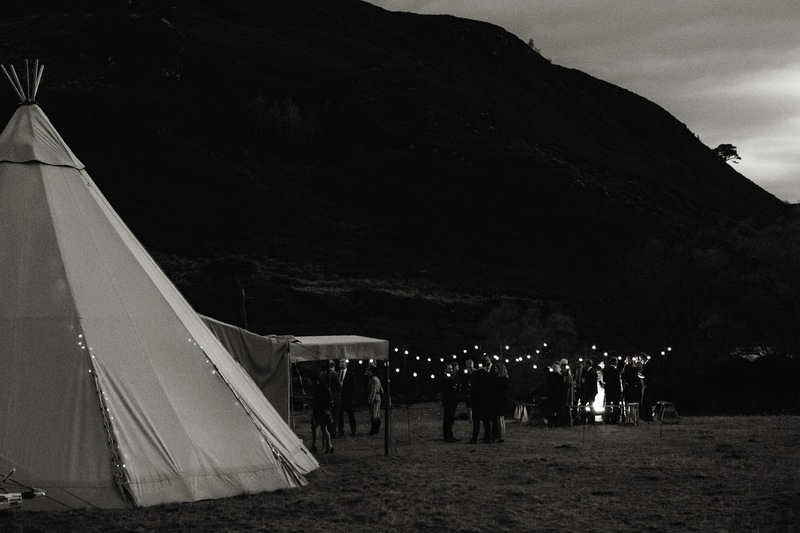 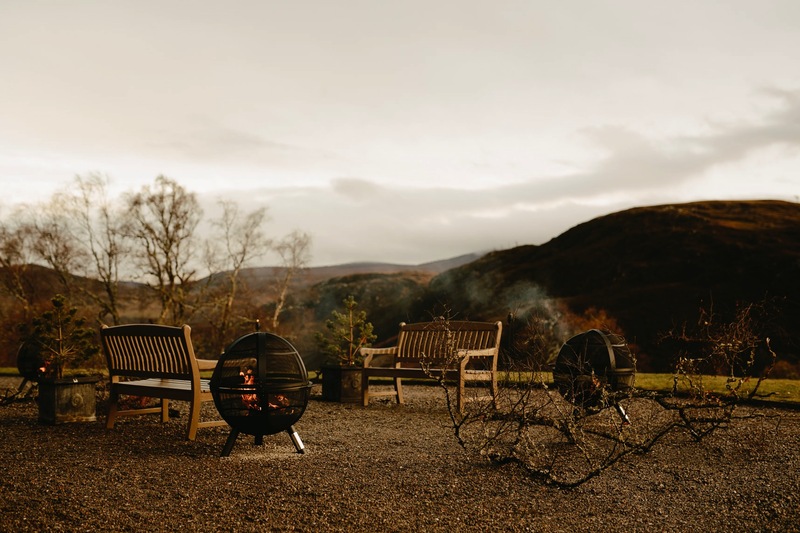 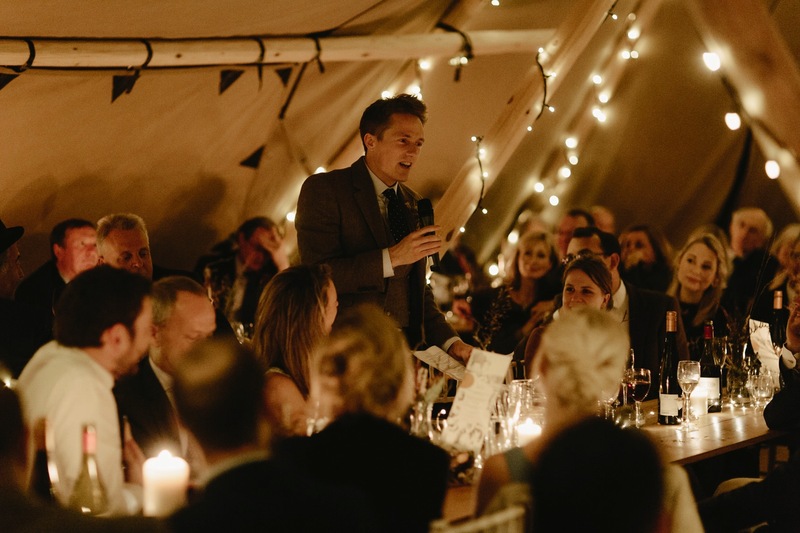 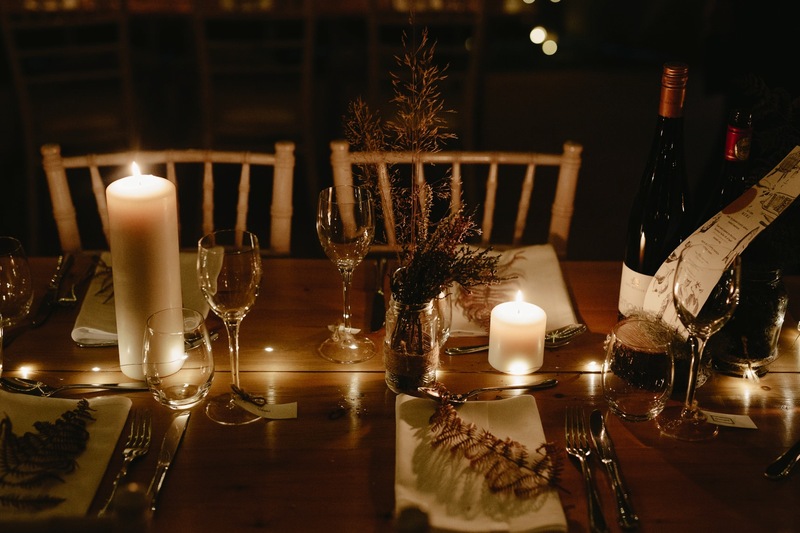 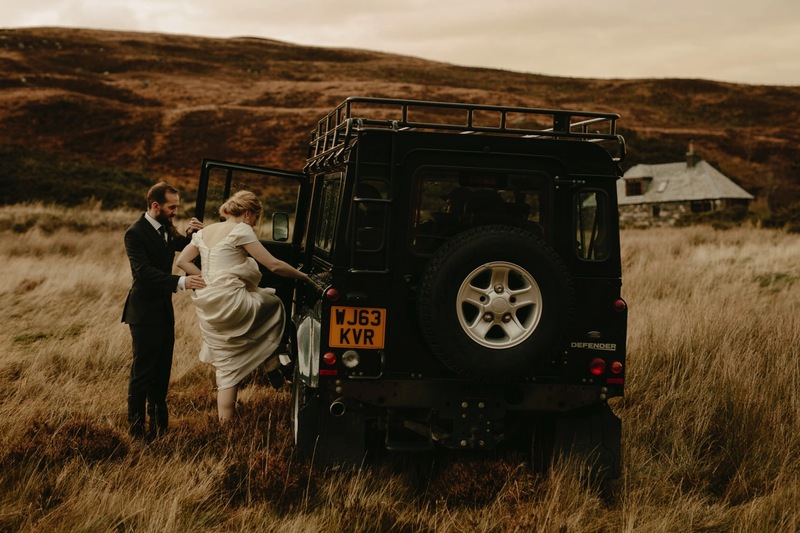 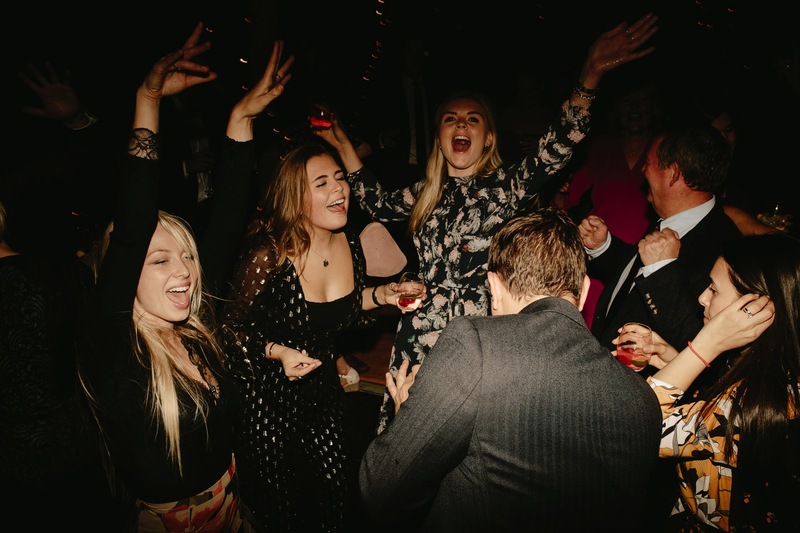 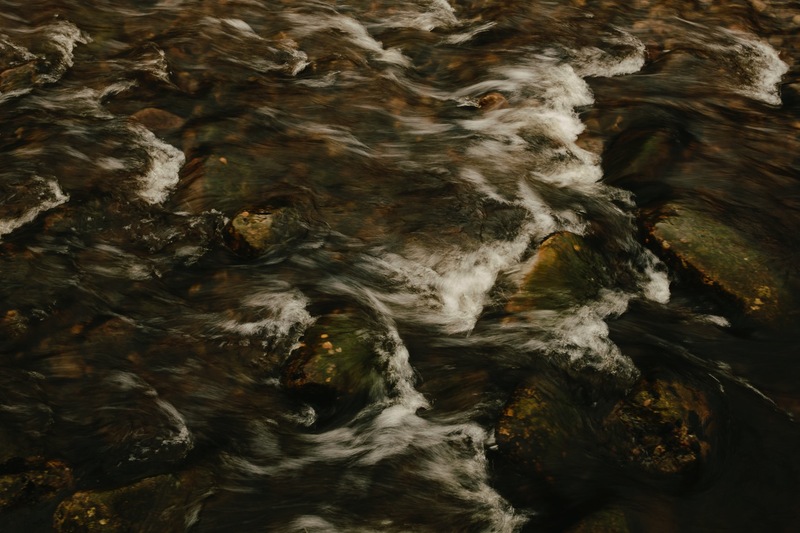 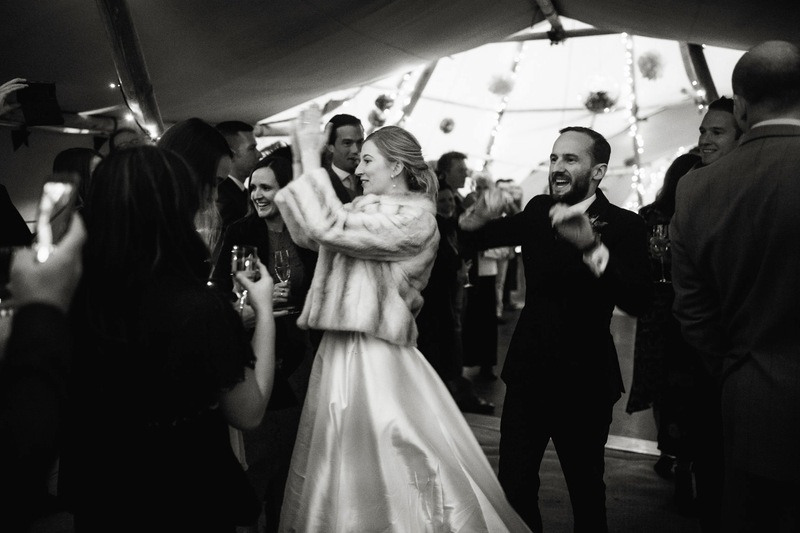 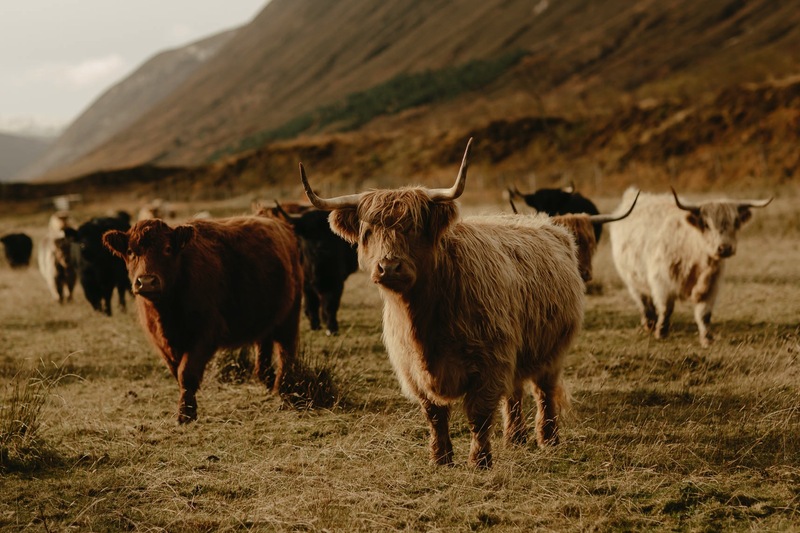 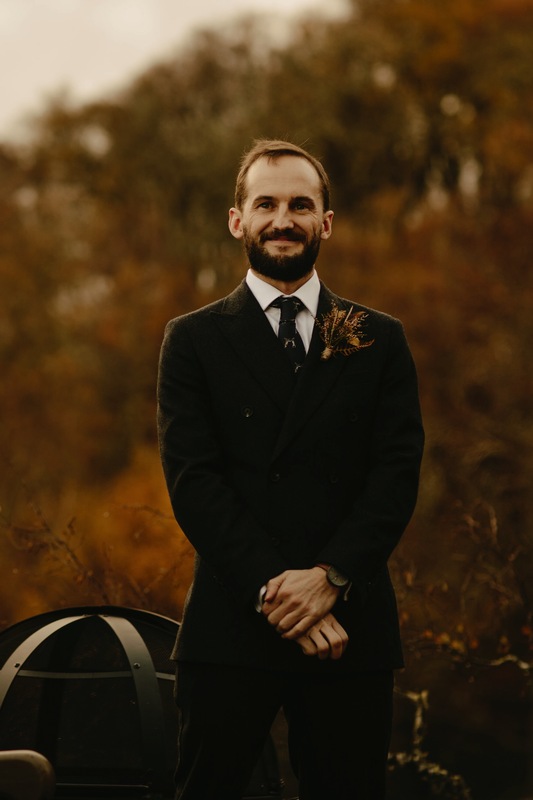 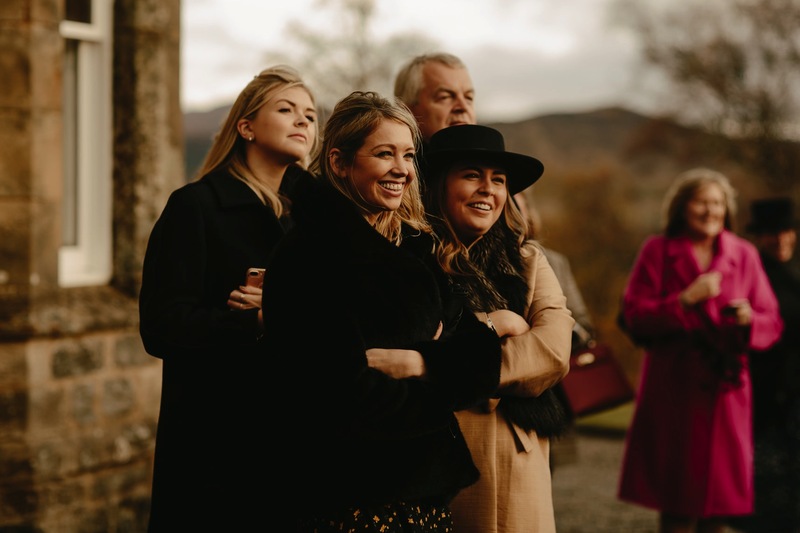 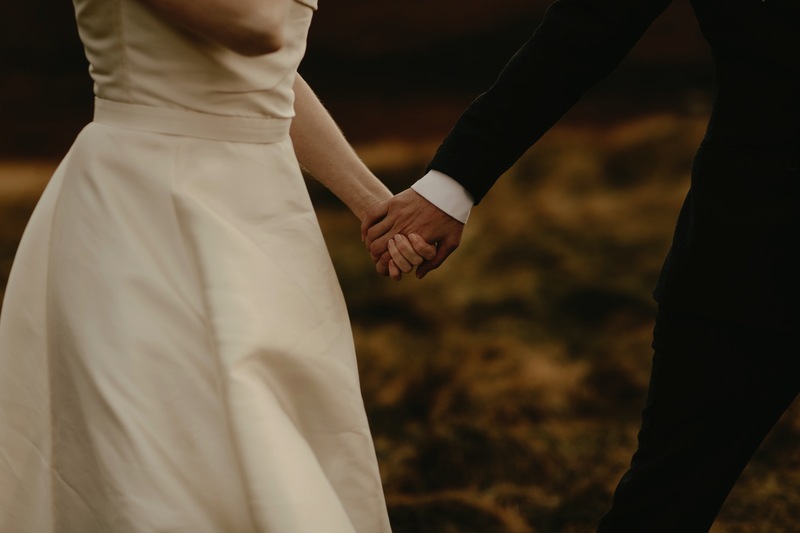 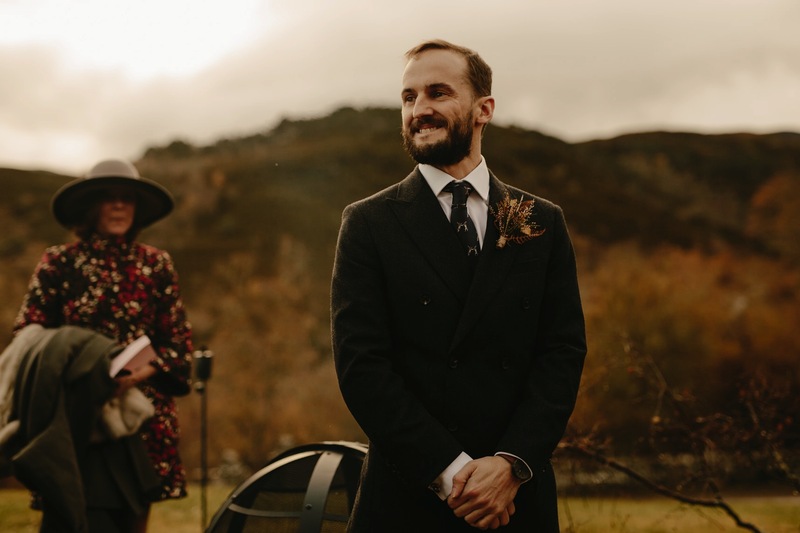 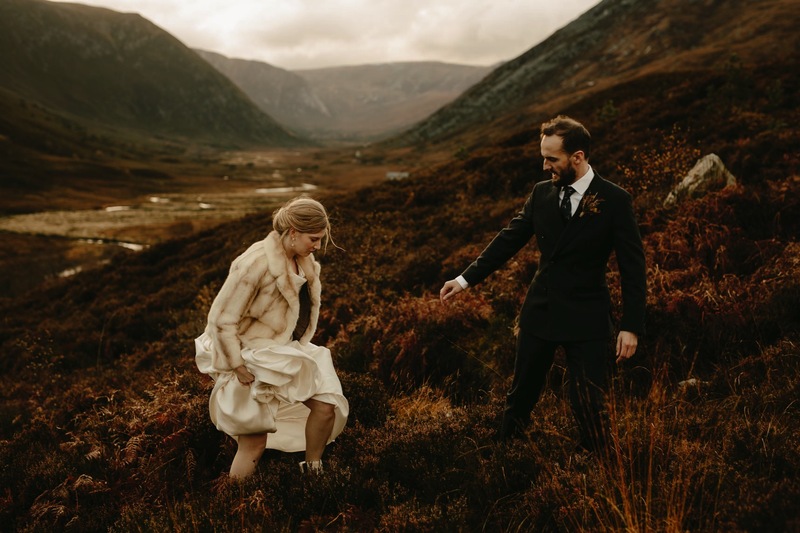 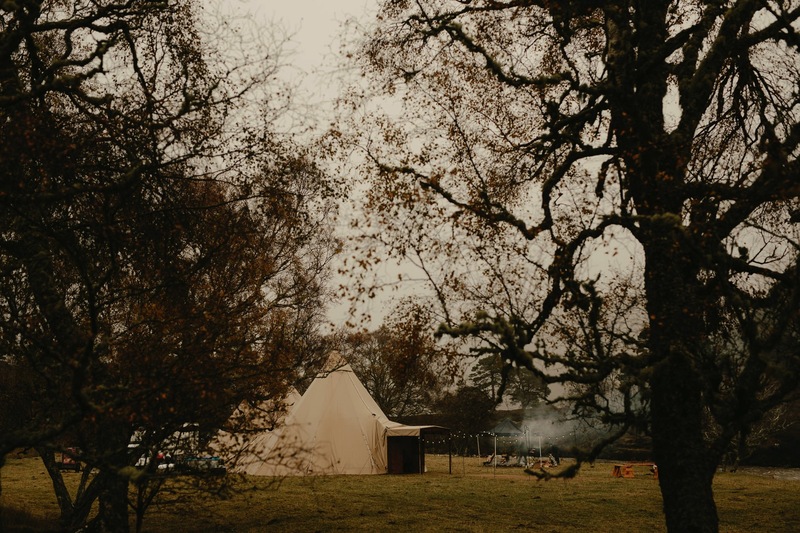 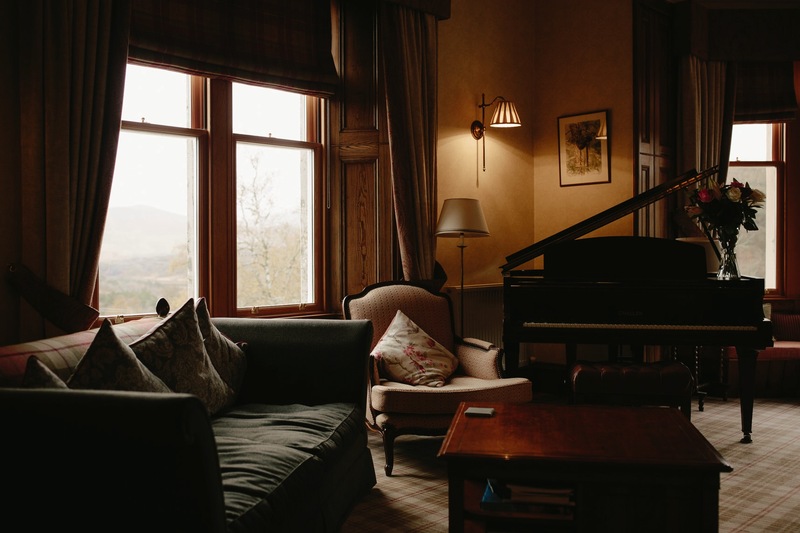 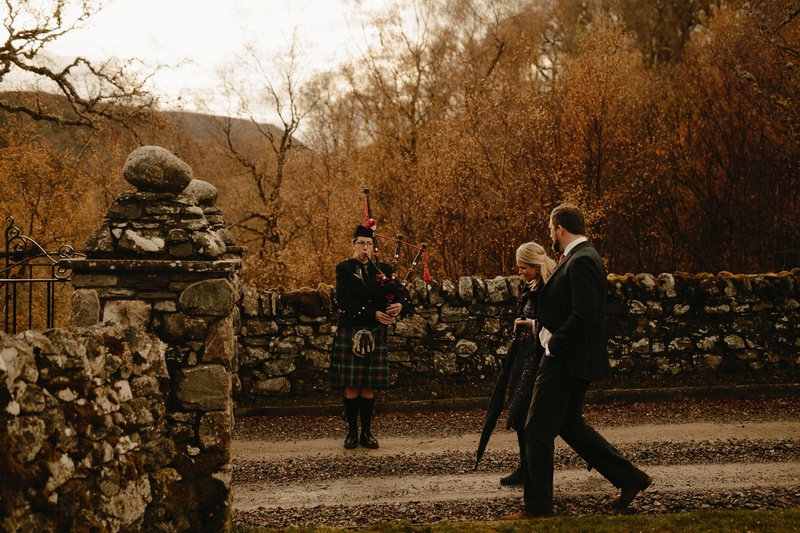 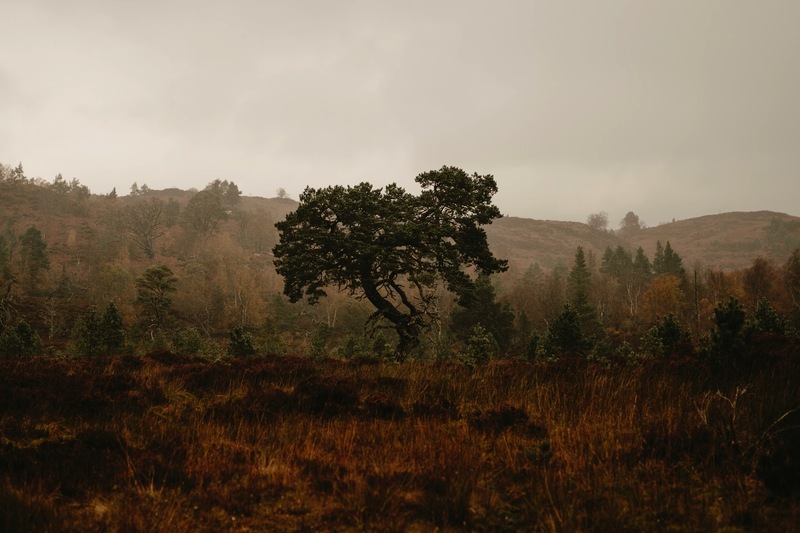 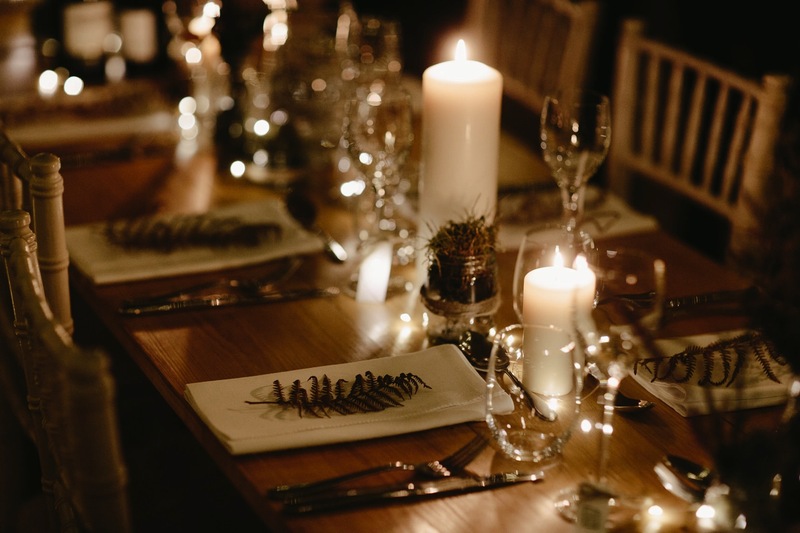 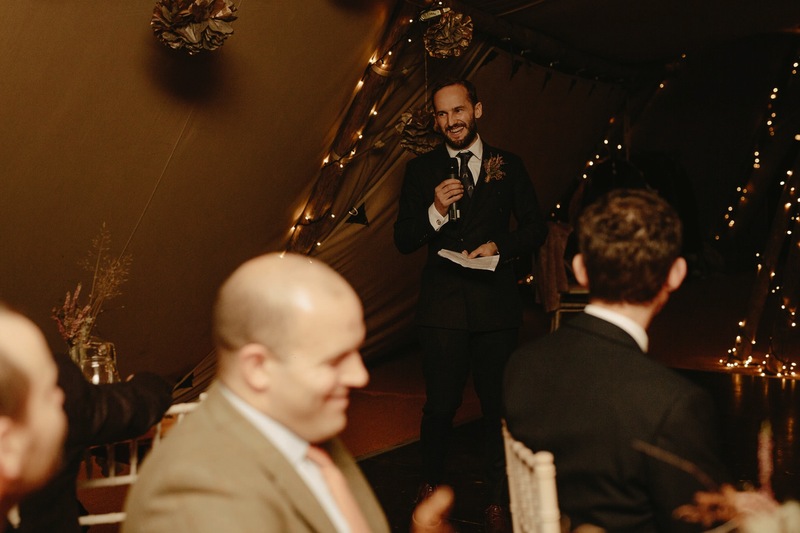 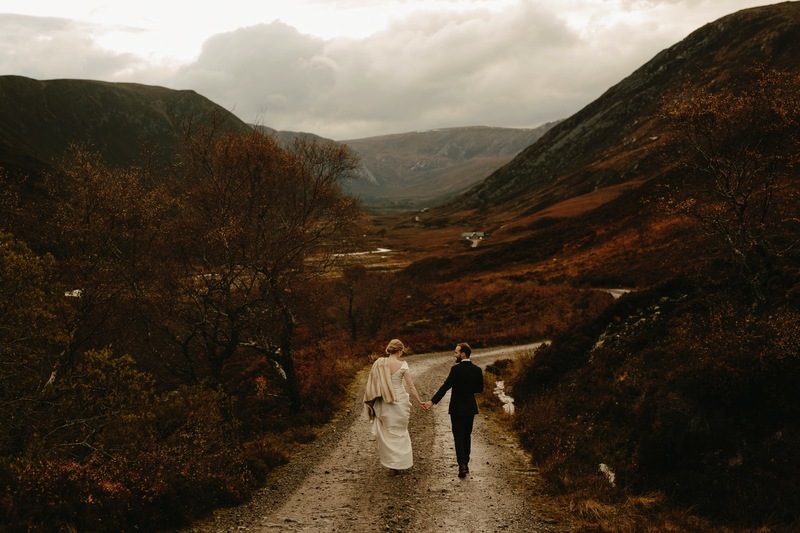 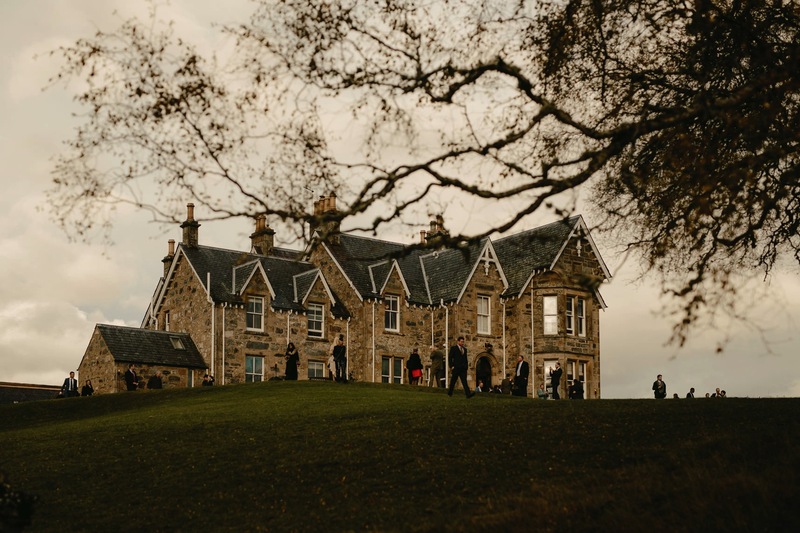 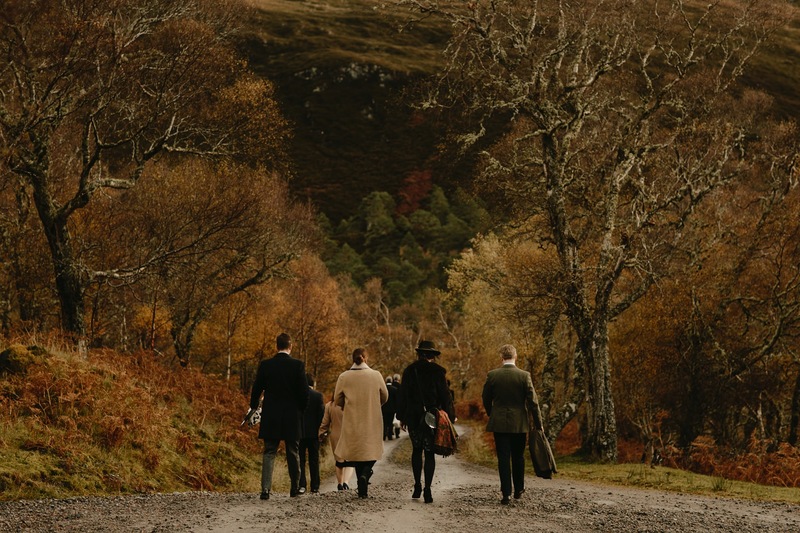 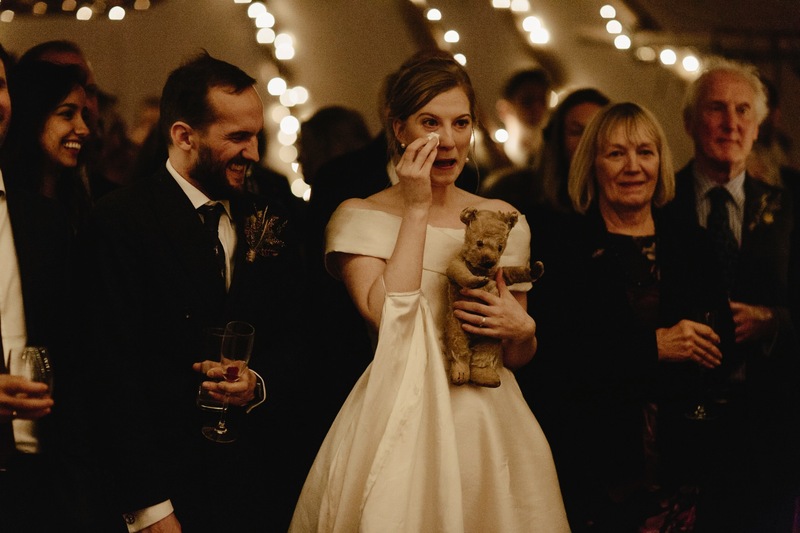 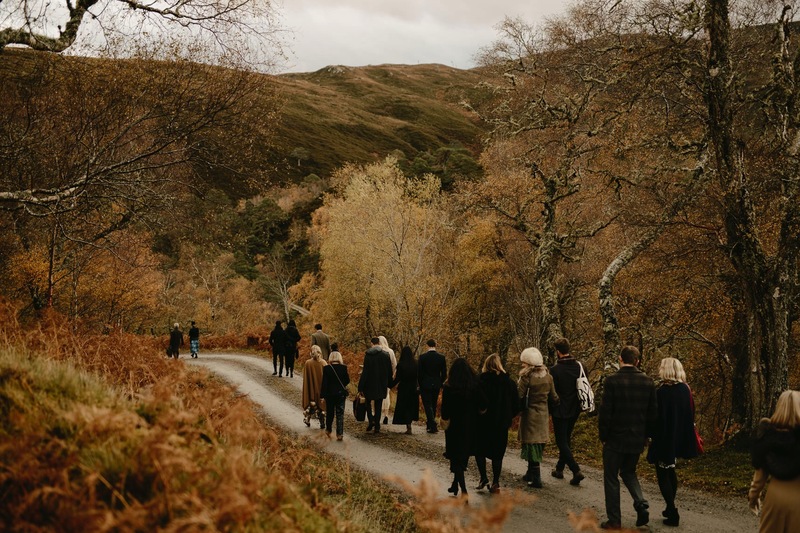 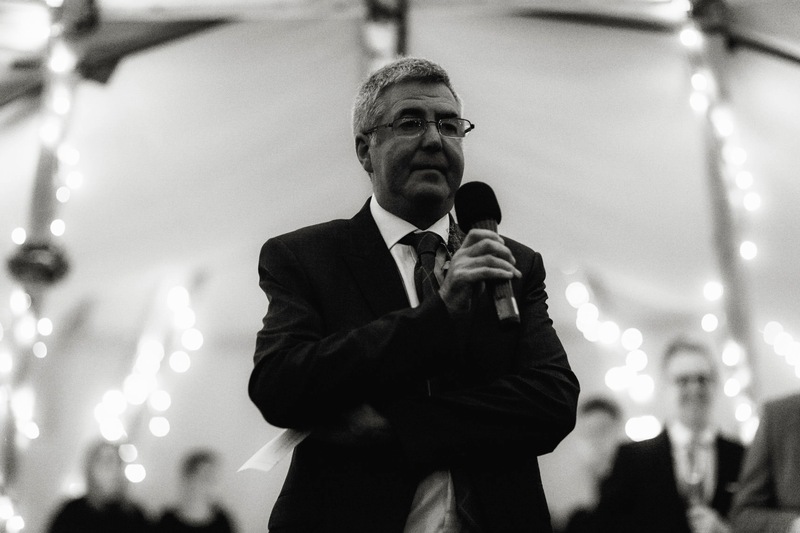 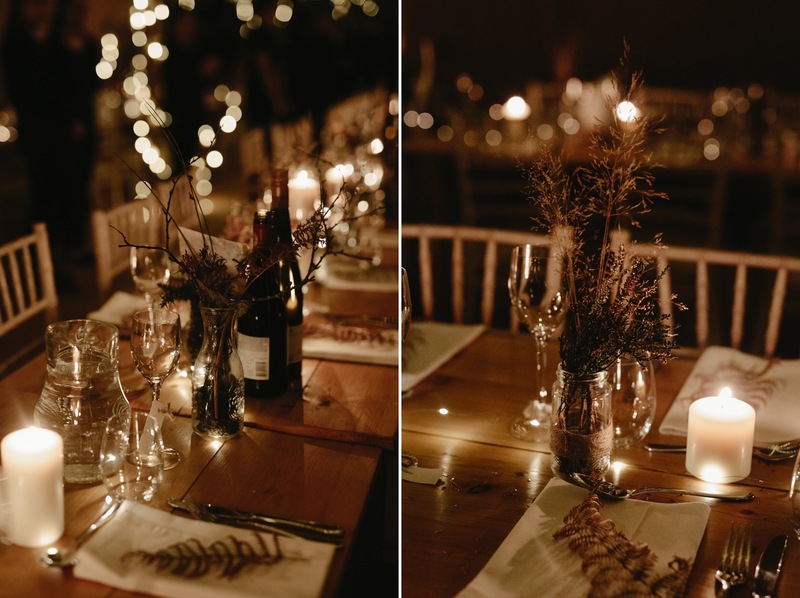 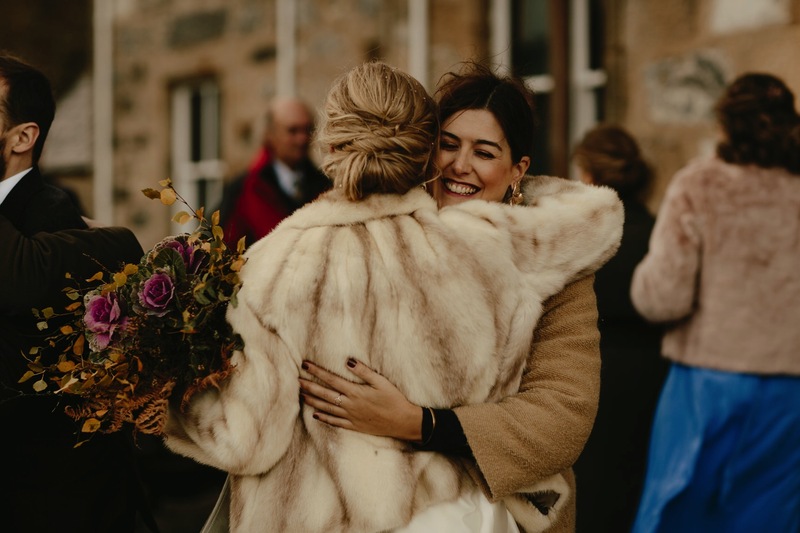 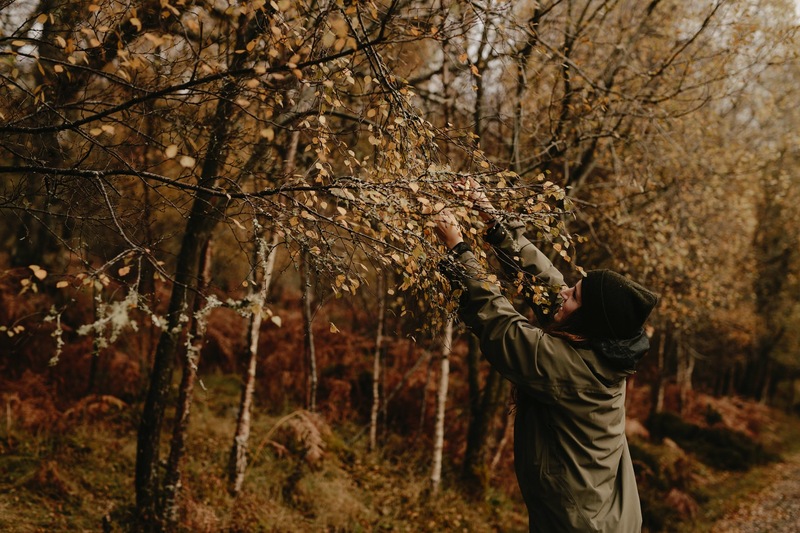 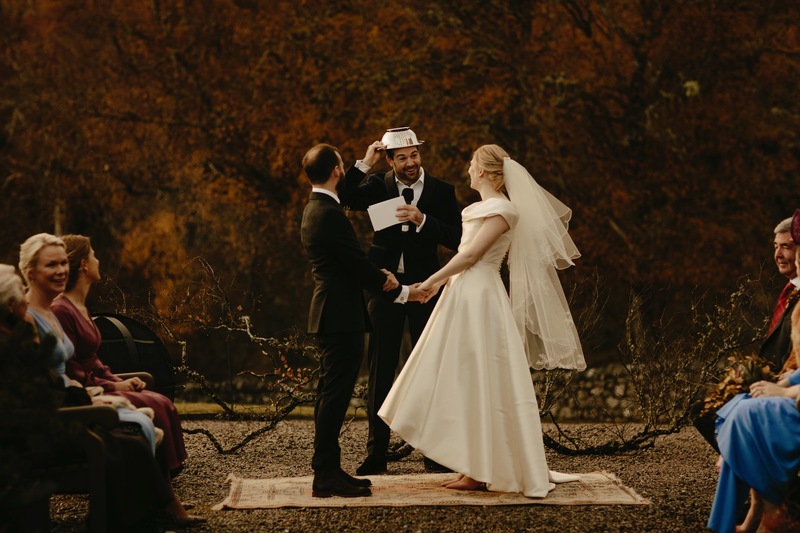 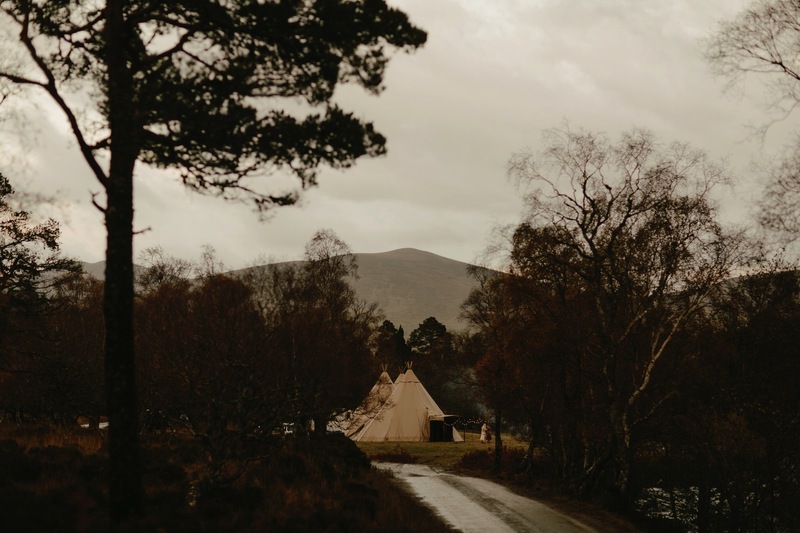 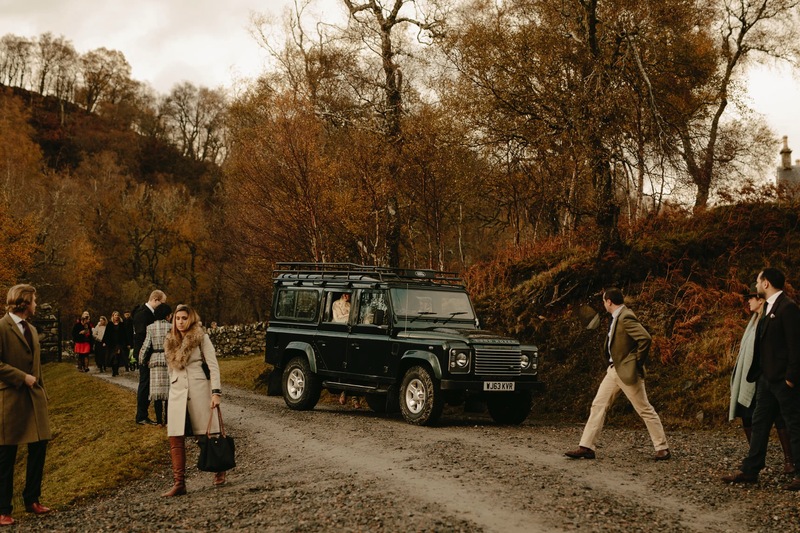 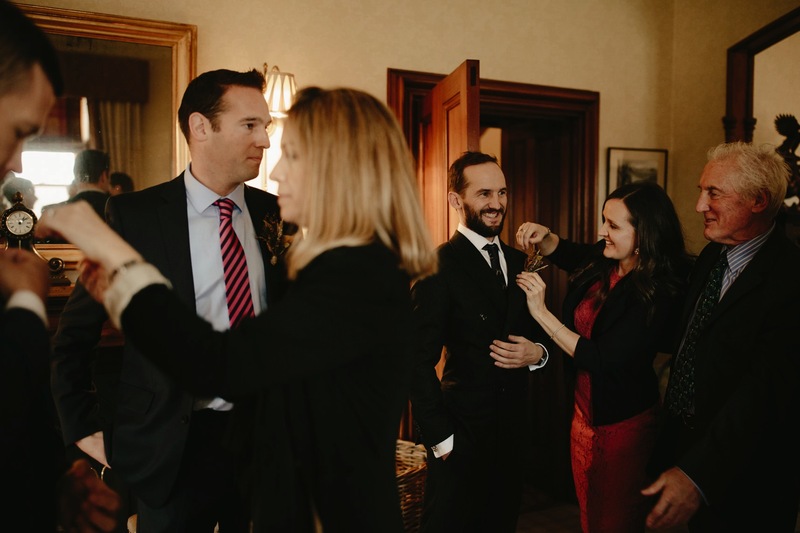 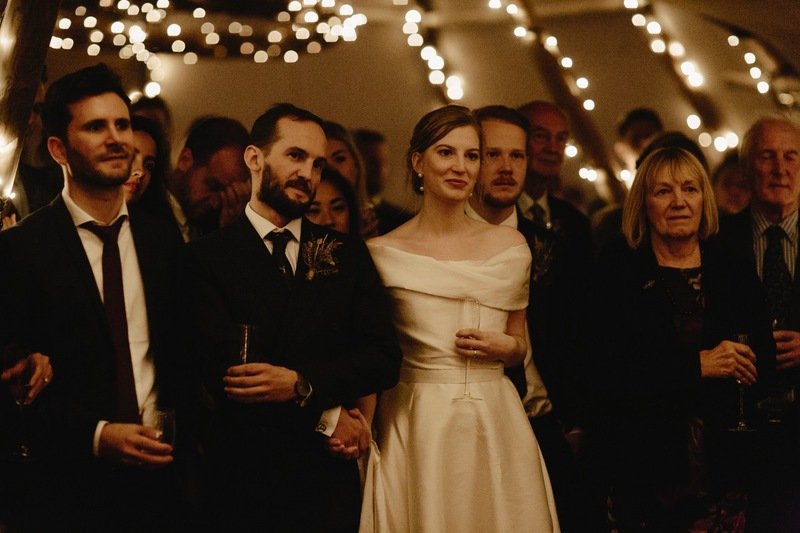 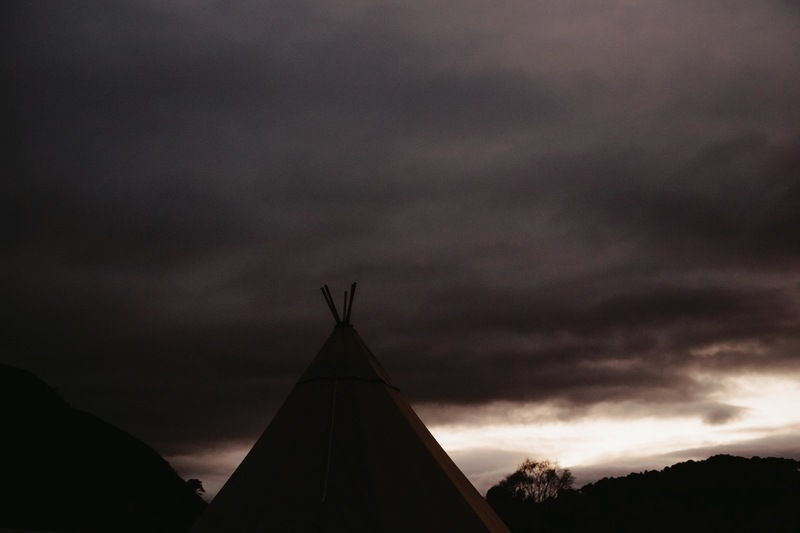 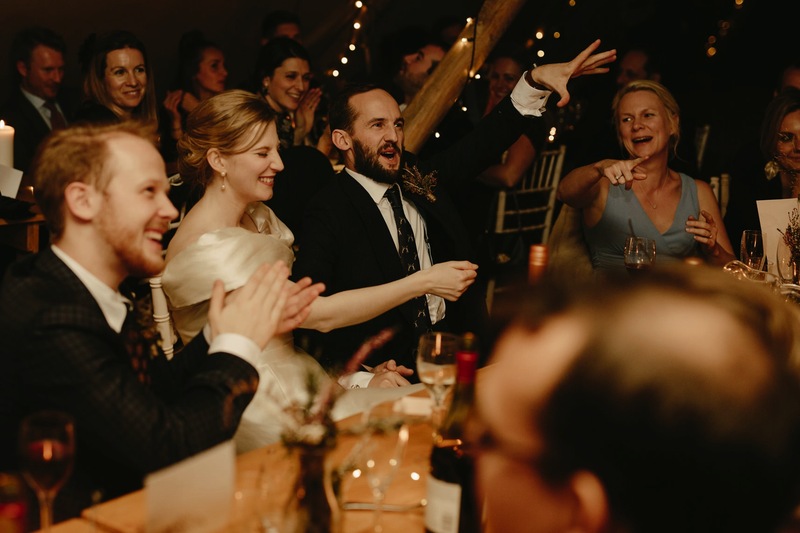 However, planning a wedding is a huge task at the best of times; even more so when you decide to hold it in one the most remote parts of the country, in the heart of the Scottish Highlands. 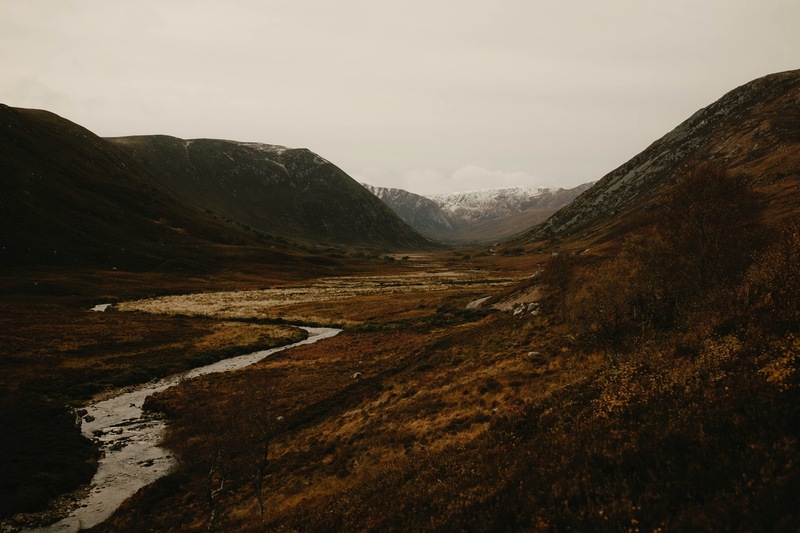 But some places are worth making the effort for, and Alladale Wilderness Reserve is definitely one of them. 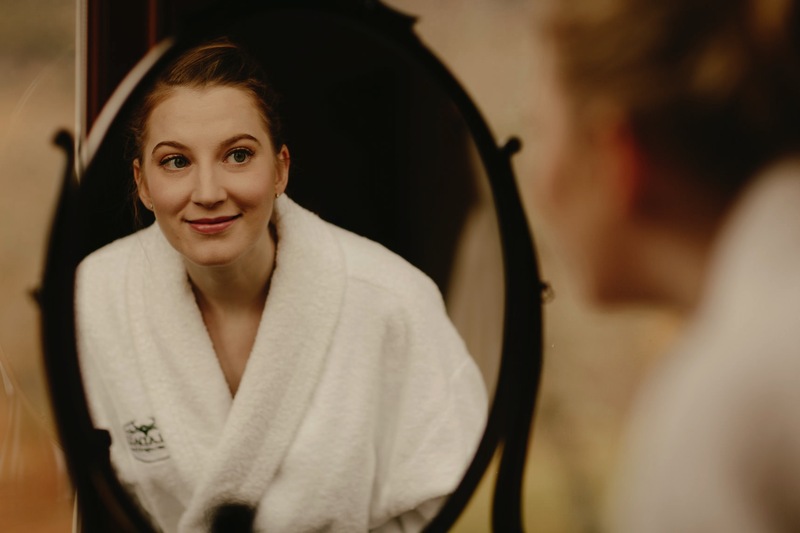 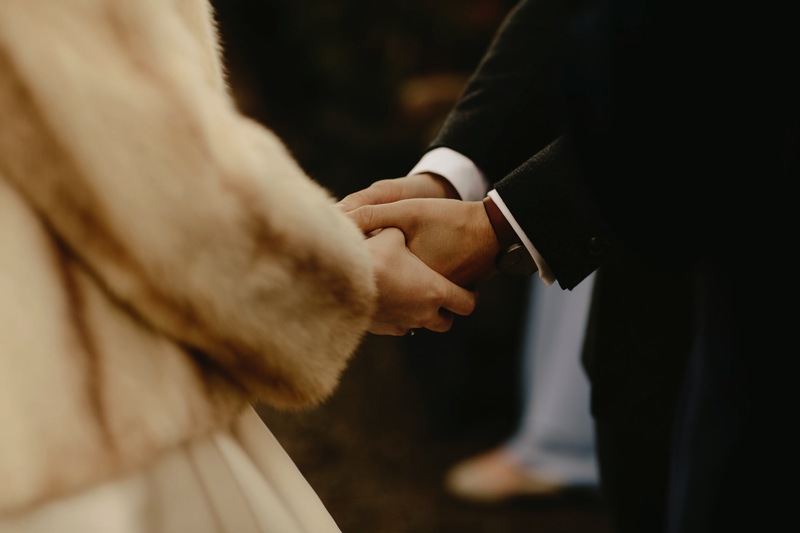 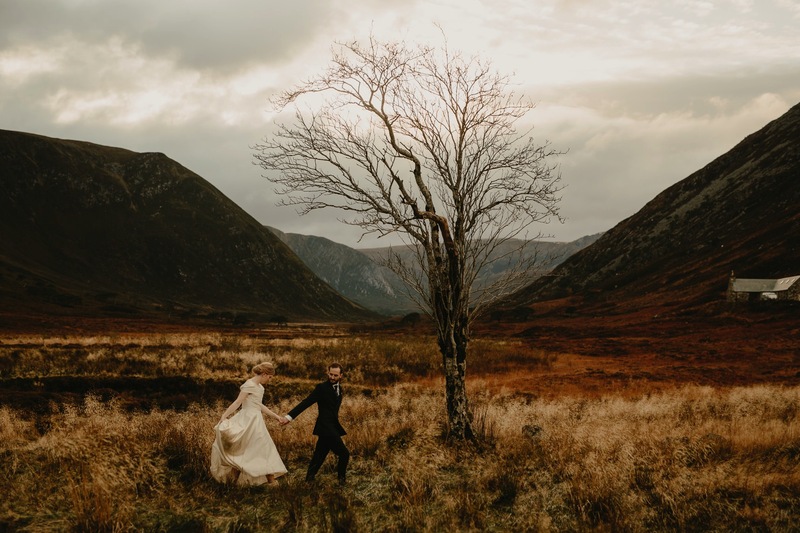 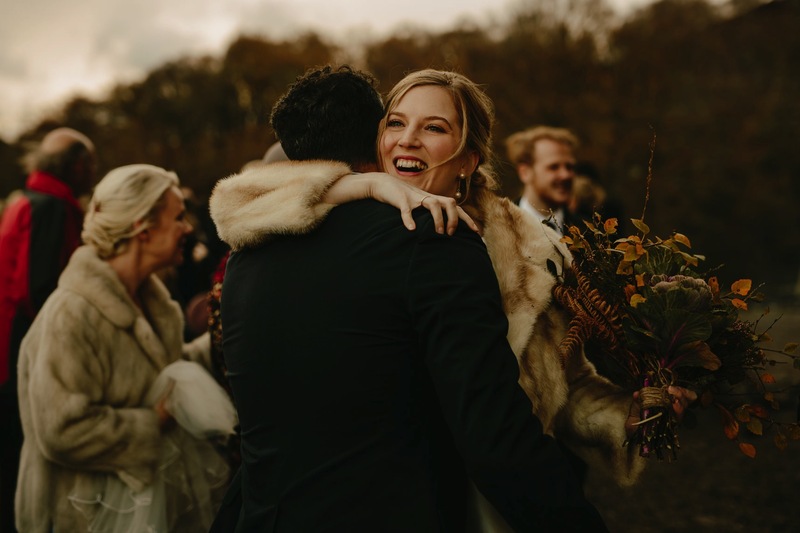 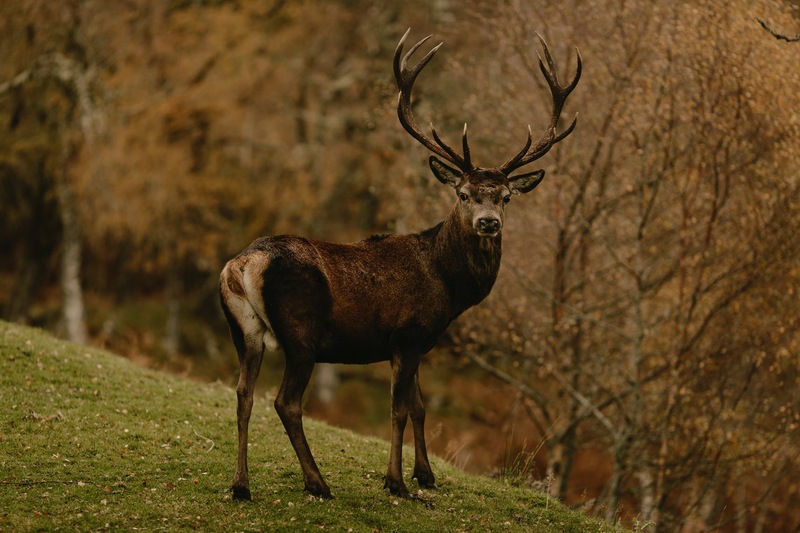 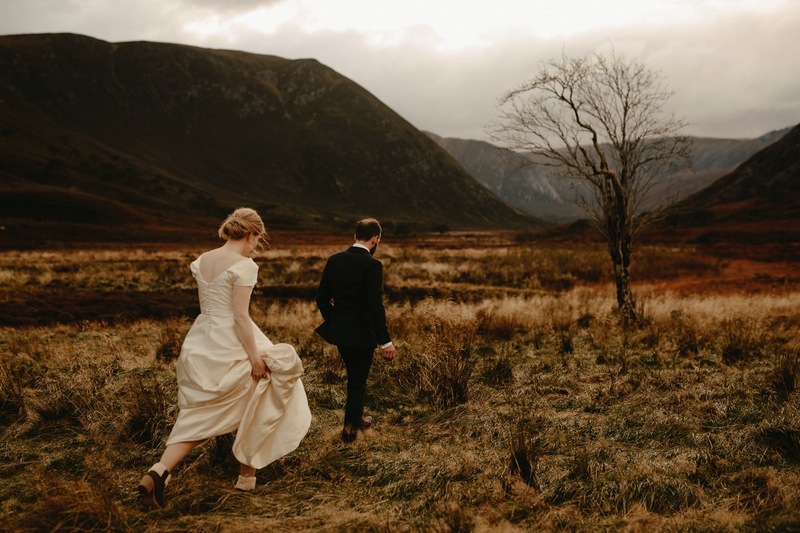 Set within 23,000 acres with nobody else for miles around, the vast landscapes of the jagged mountains, deep Glens filled with extraordinary wildlife make it such an idyllic spot for a wedding. 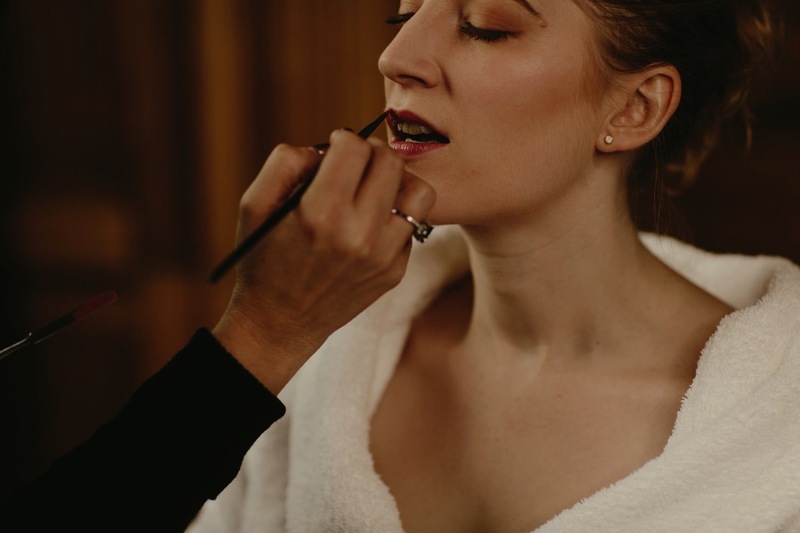 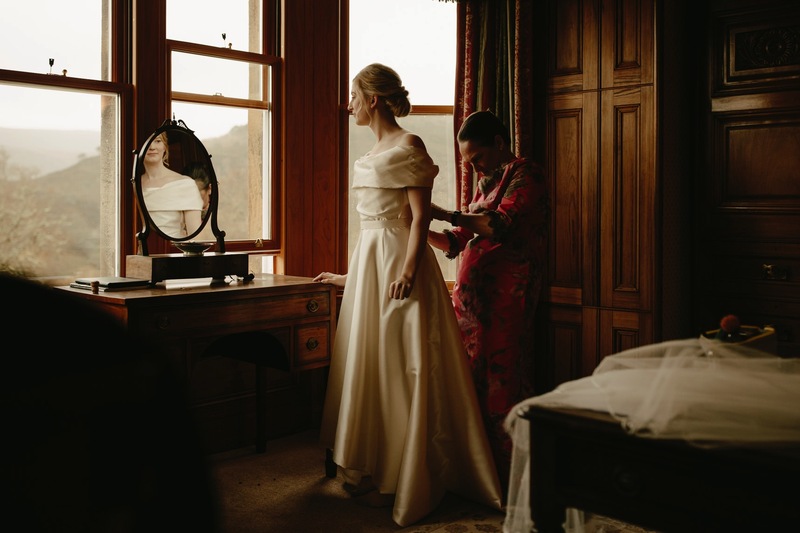 The day started with Charlie getting ready in Alladale lodge, looking out across the estate whilst her friend foraged the land to create her bouquet. 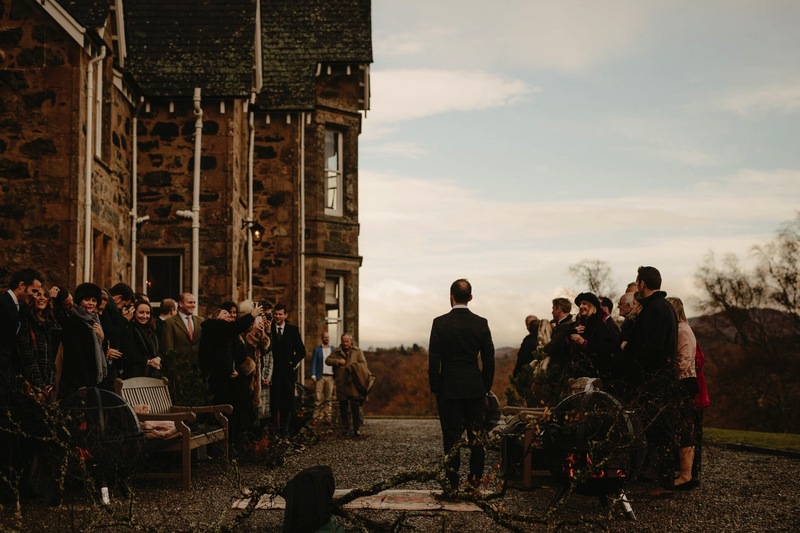 From the start of their planning, Charlie dreamt of holding the ceremony outdoors, but the highland weather was doing its best to scupper these plans. 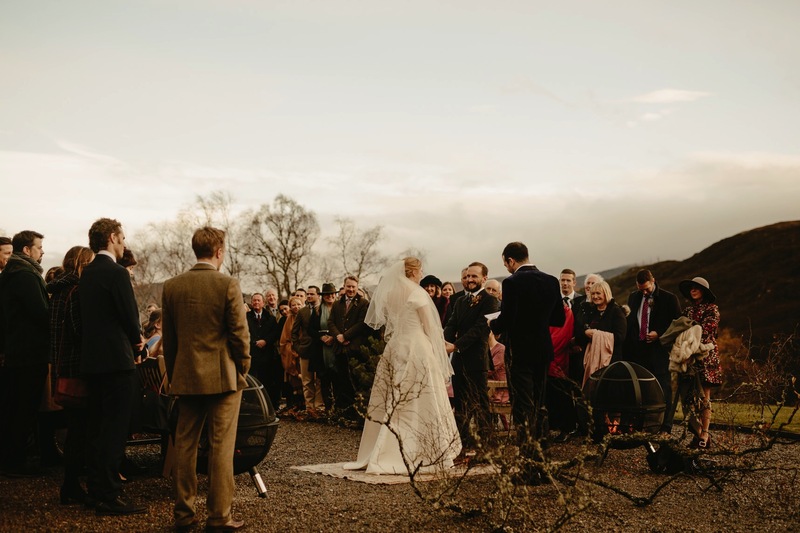 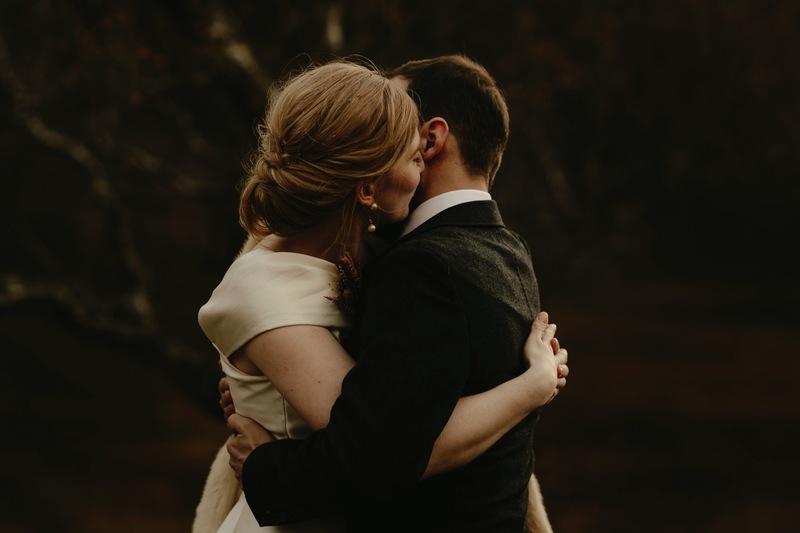 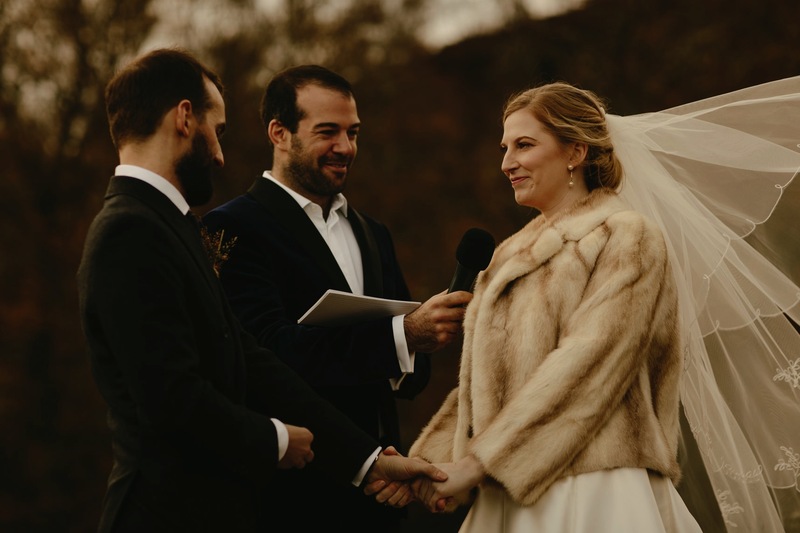 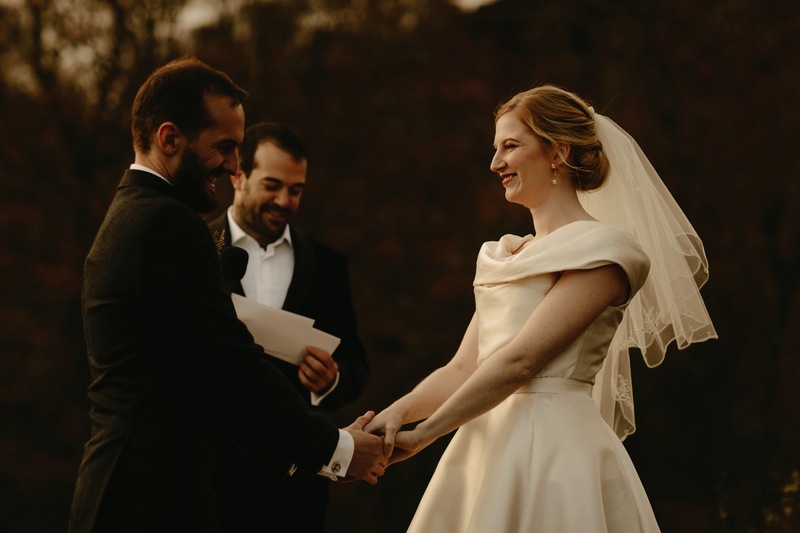 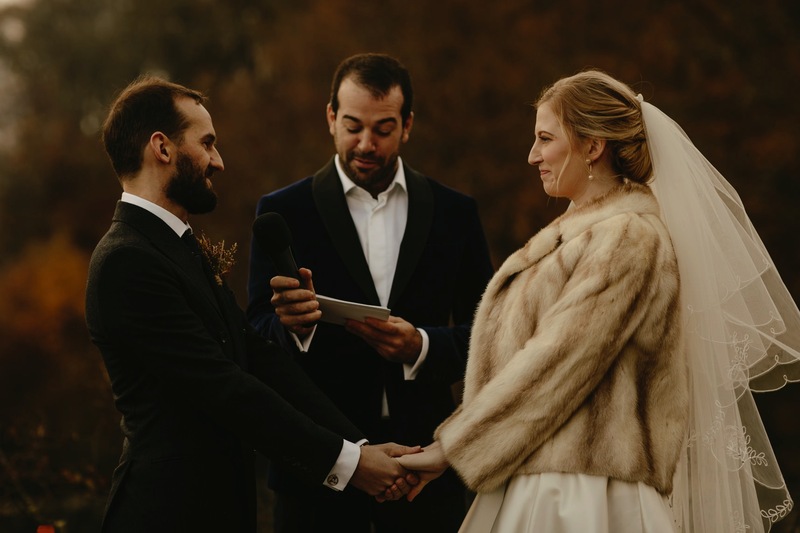 Just as their plans were altered to hold the ceremony inside the lodge, a break in the rain resulted in everyone dashing back outside, with the perfectly timed dark skies clearing long enough for them to share their vows up on the hill. 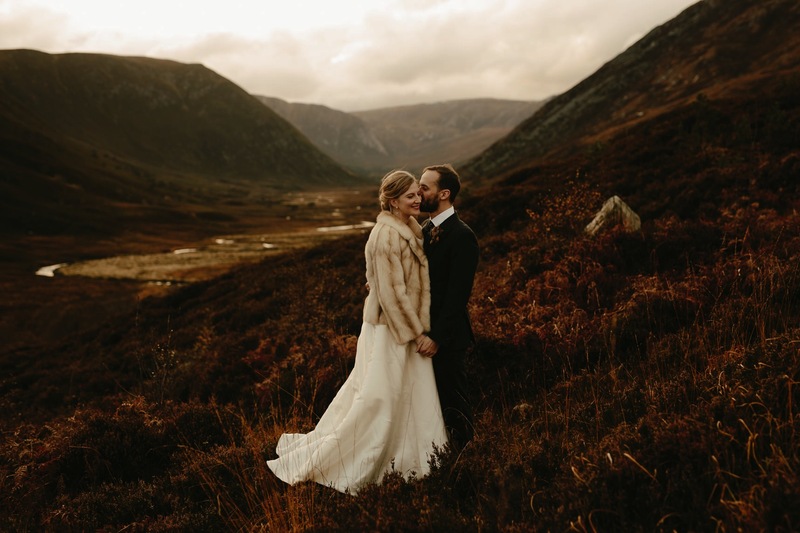 As the heavens opened once again, we wrapped up warm and headed into the Glen, embracing the final moments of the Autumnal light before moving along beside the river to feast on the most amazing meats cooked over the coals inspired by their experience in Patagonia, followed up by the most heartfelt of speeches from Charlie’s father and Rob. 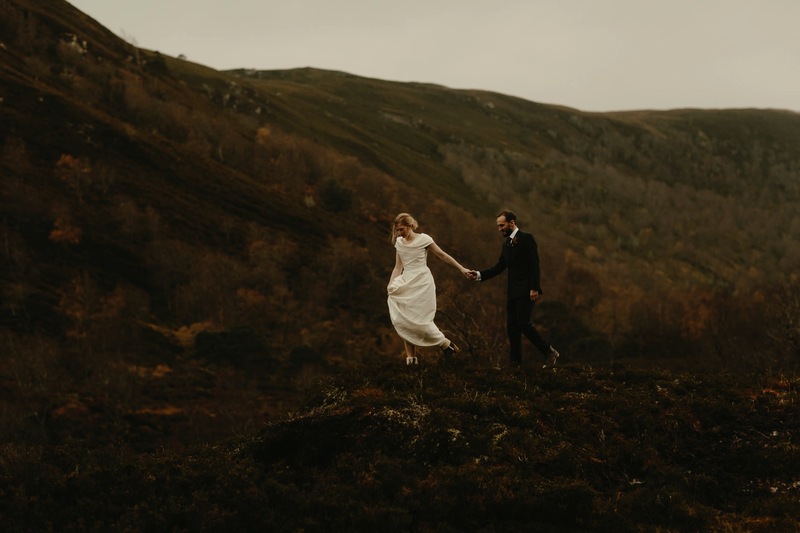 This was such a wild adventure in the most peaceful of places. 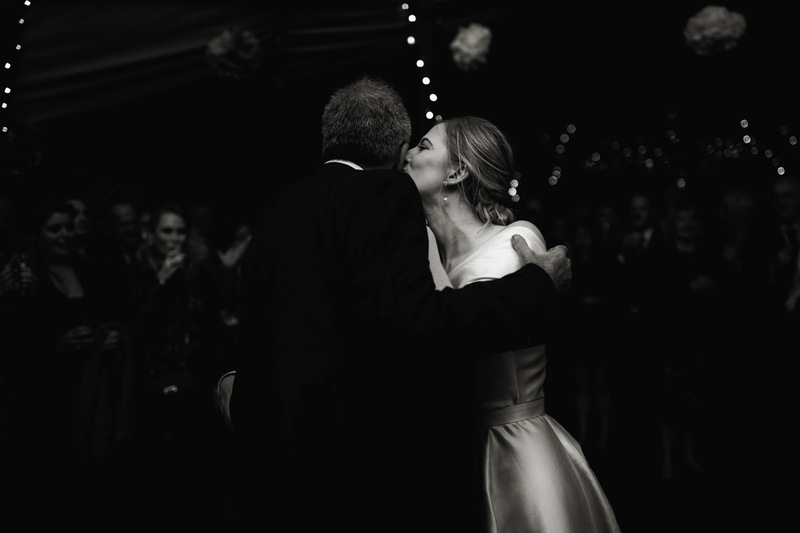 It was a true reflection of everything they love, shared with the people they love. 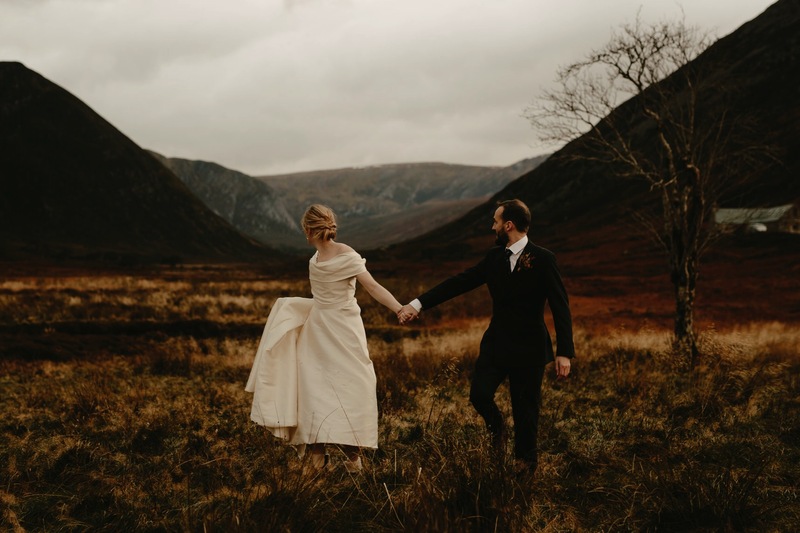 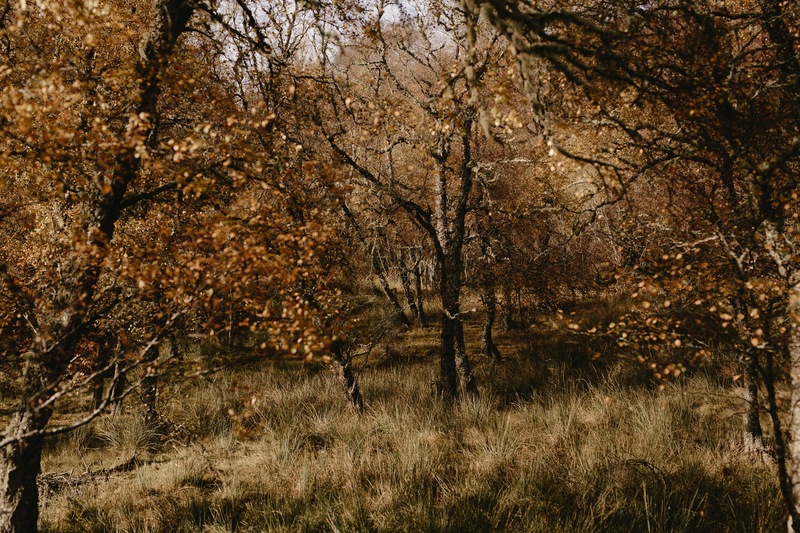 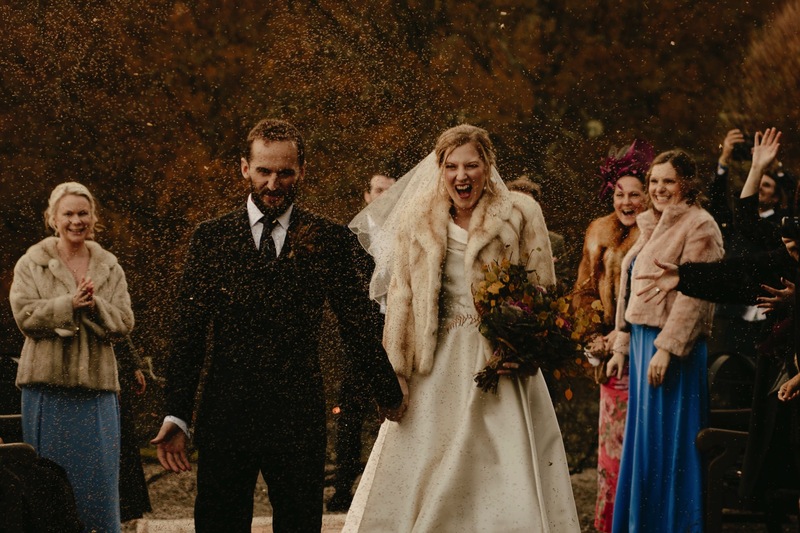 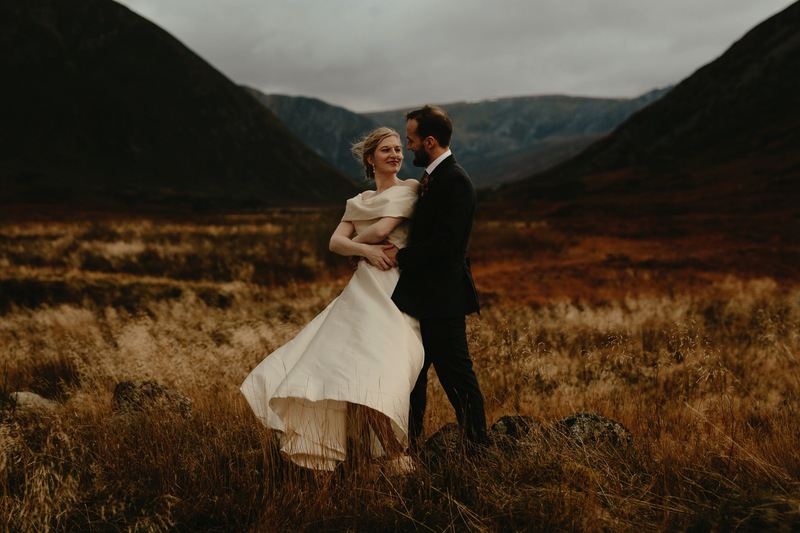 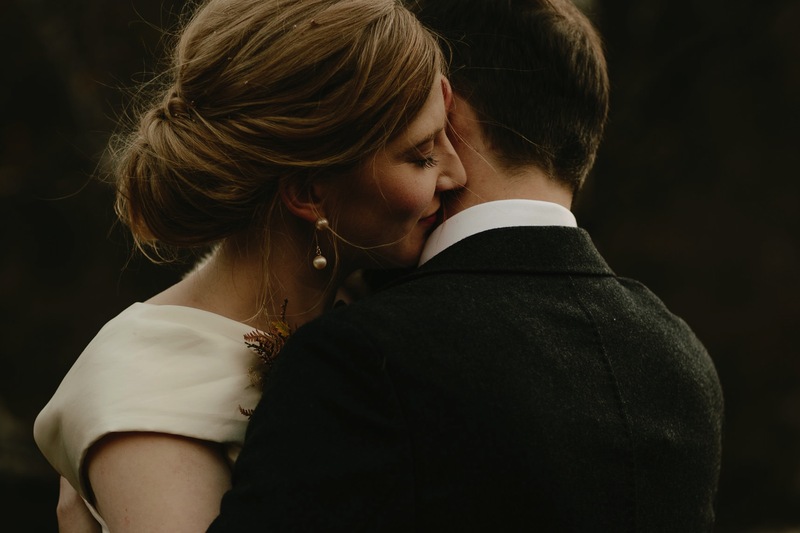 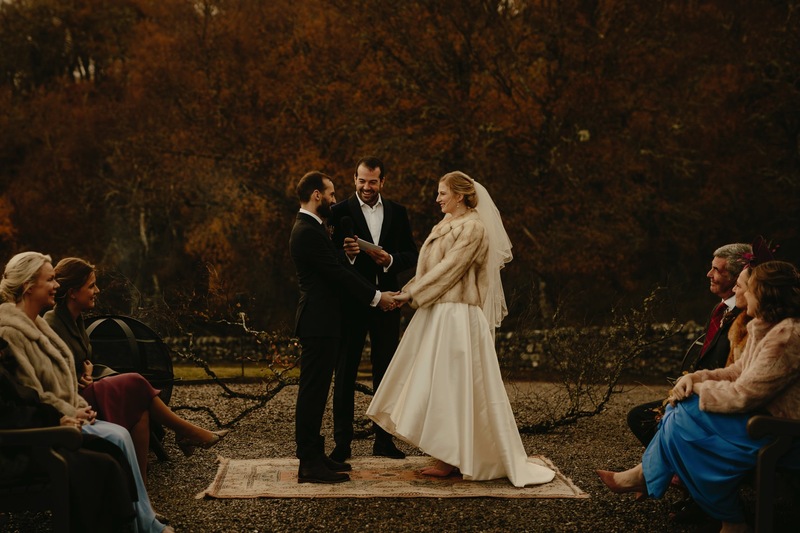 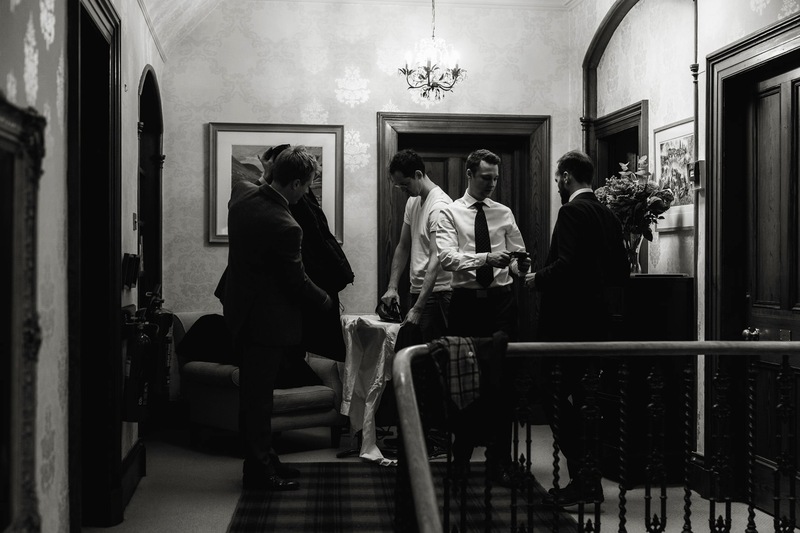 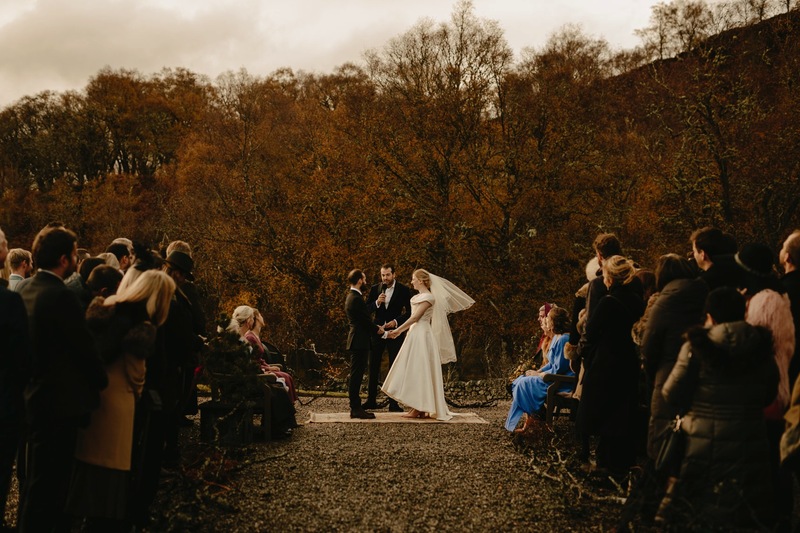 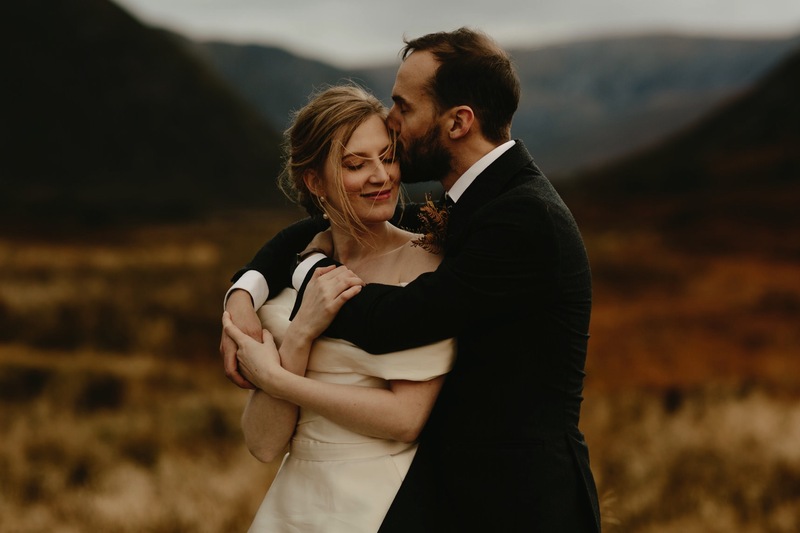 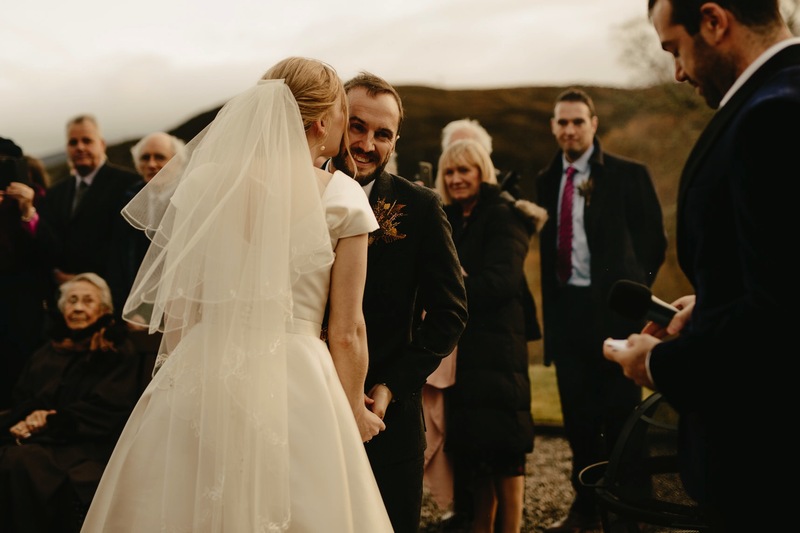 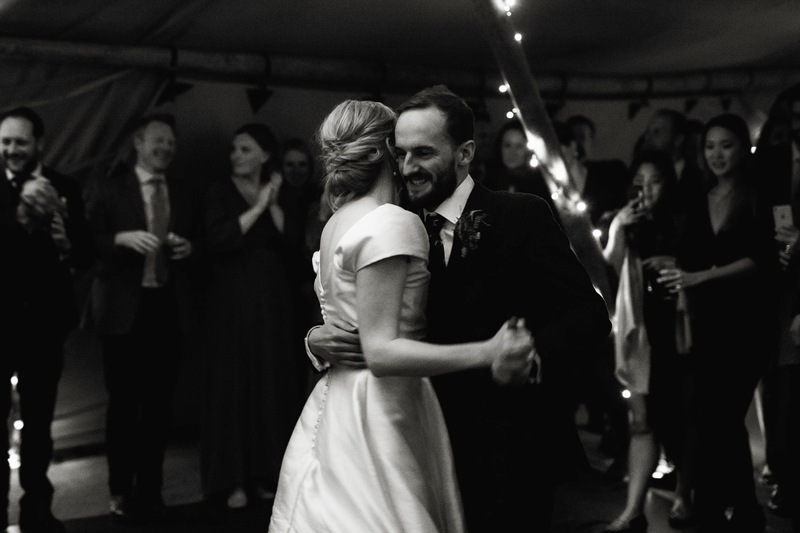 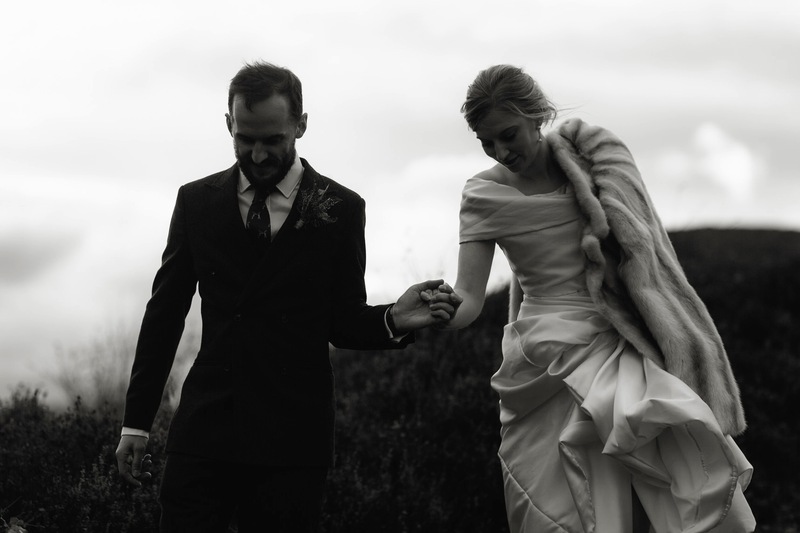 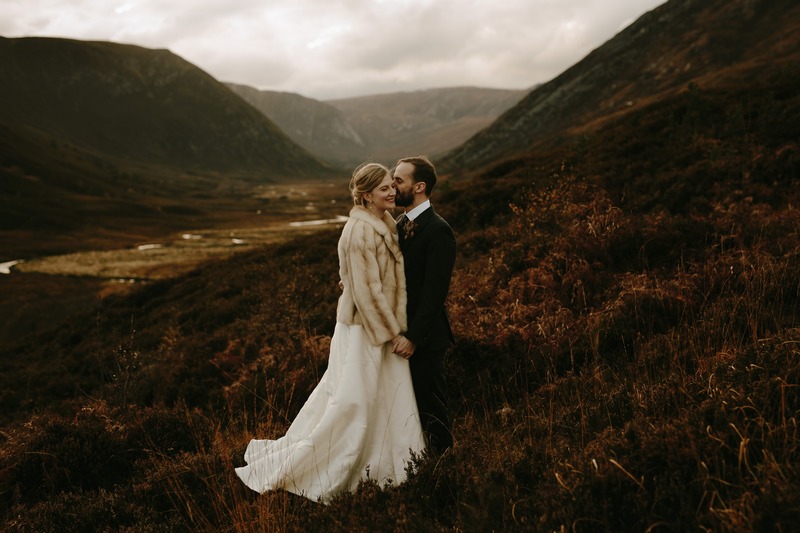 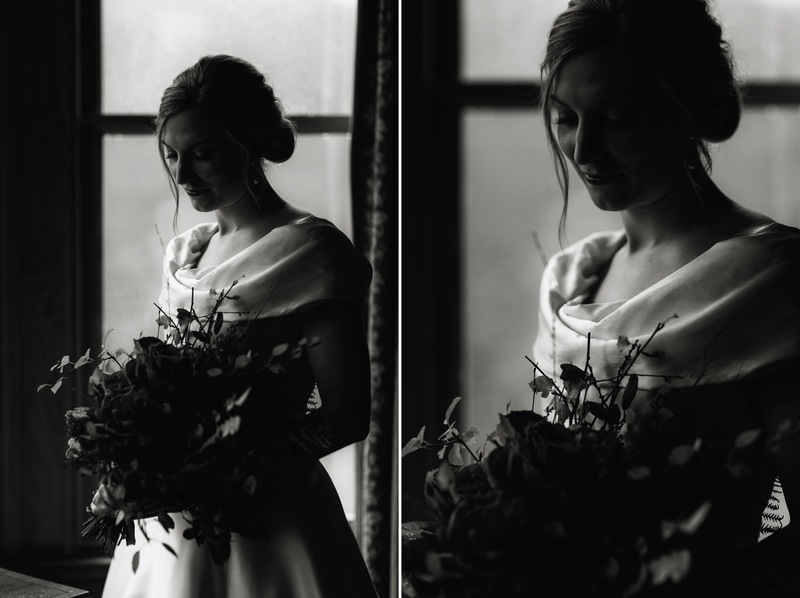 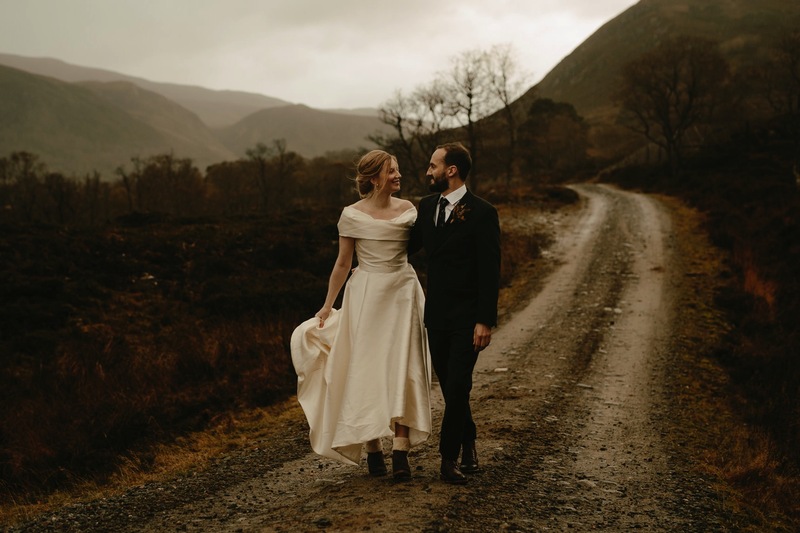 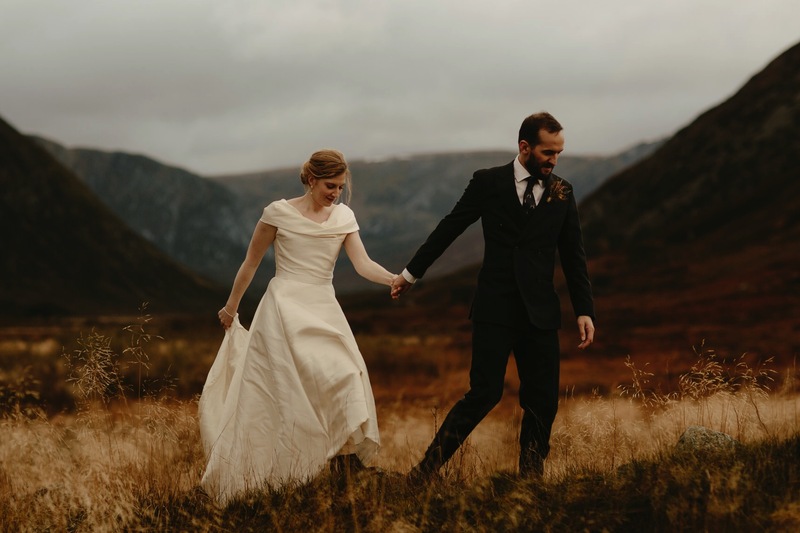 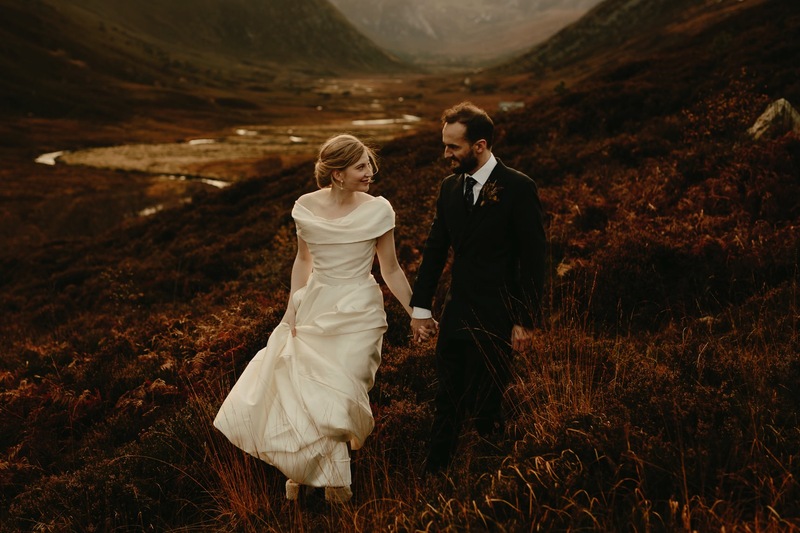 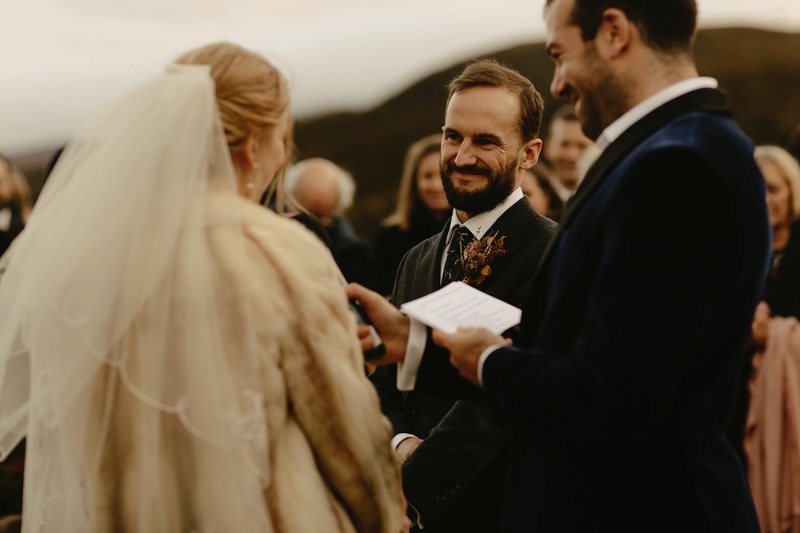 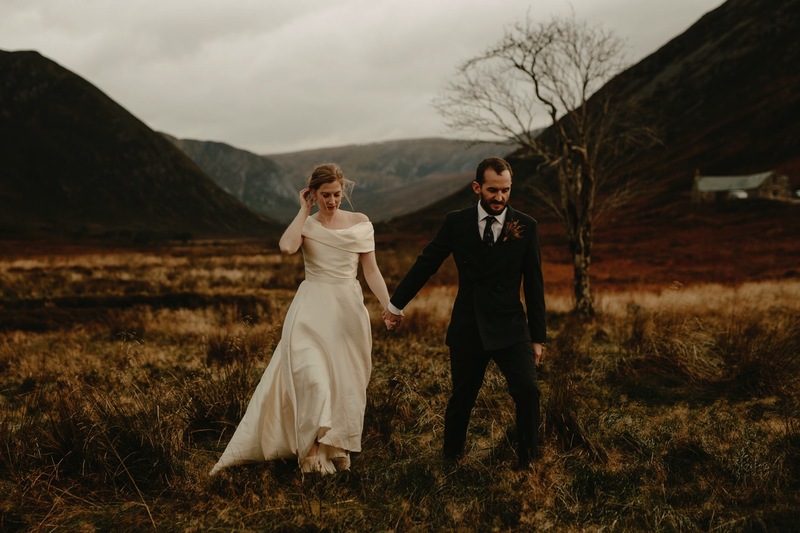 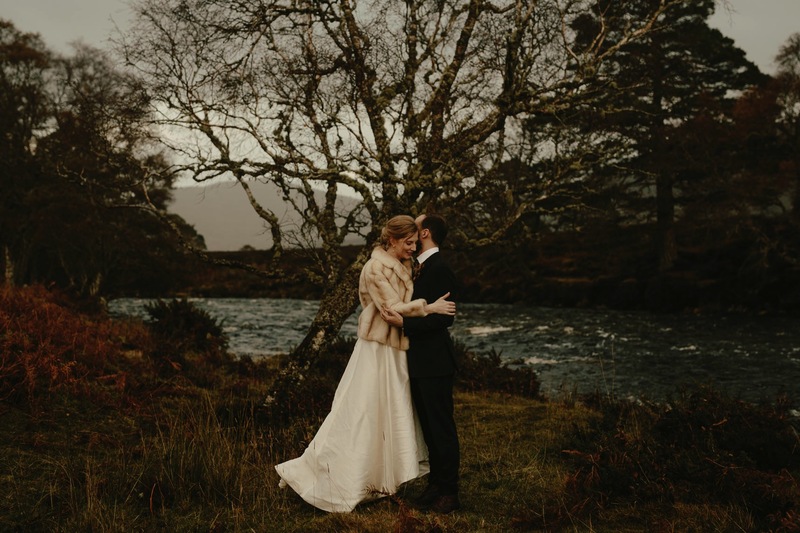 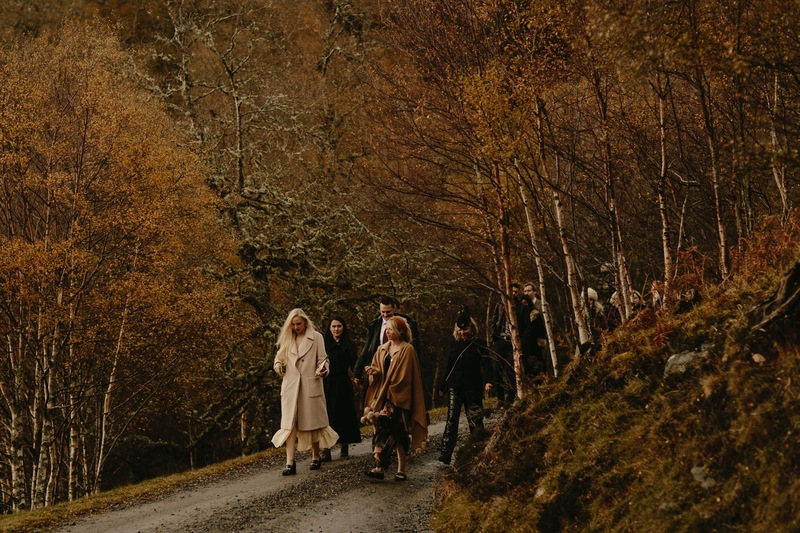 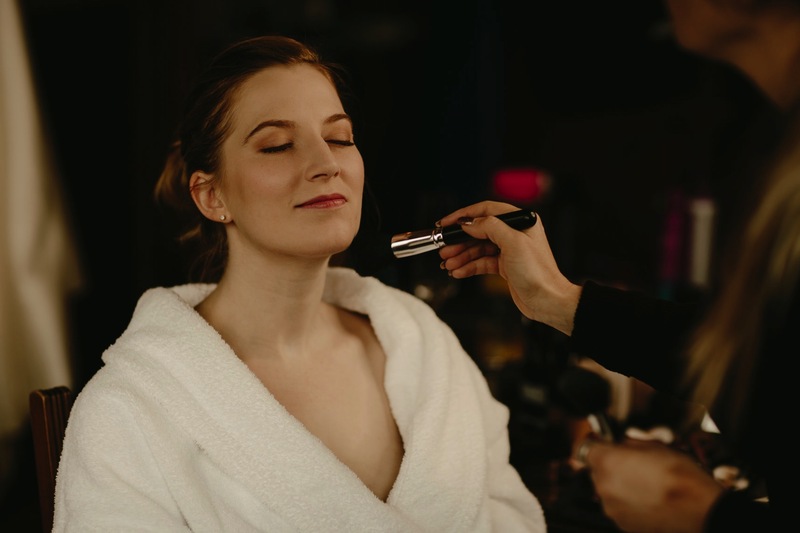 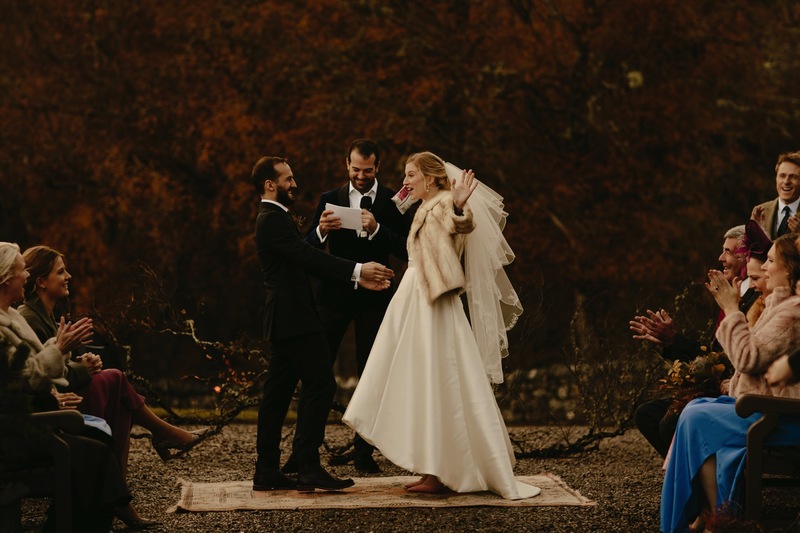 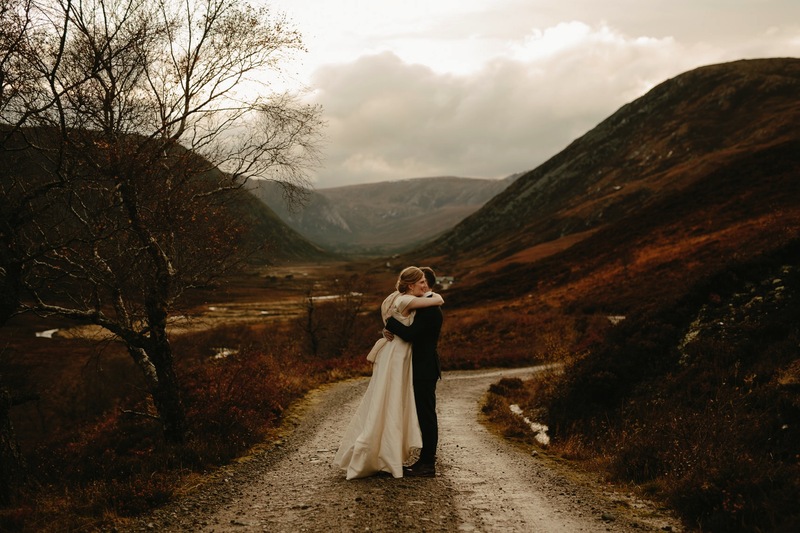 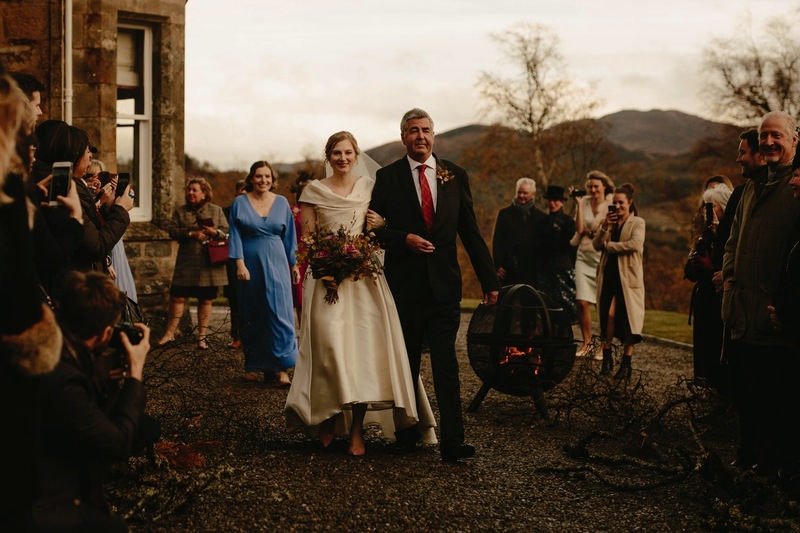 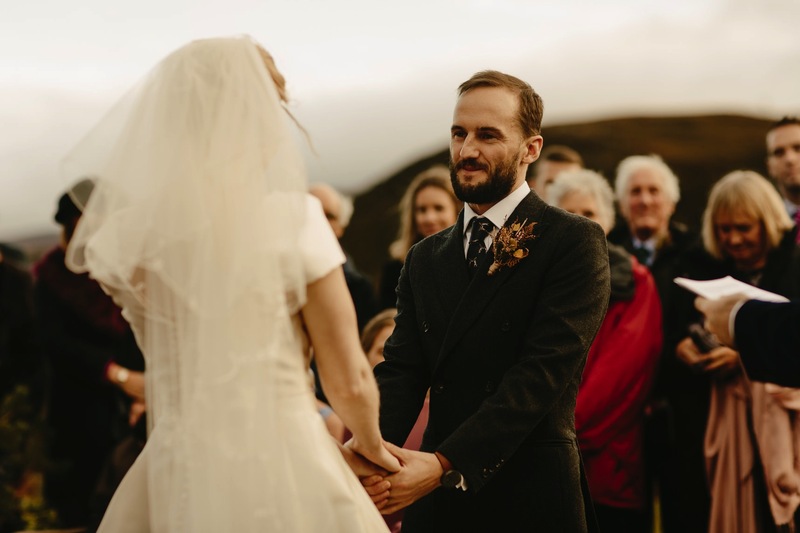 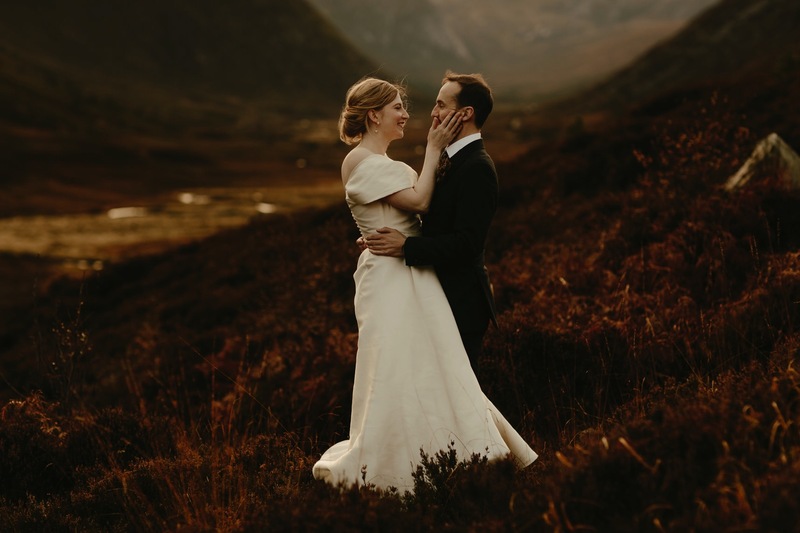 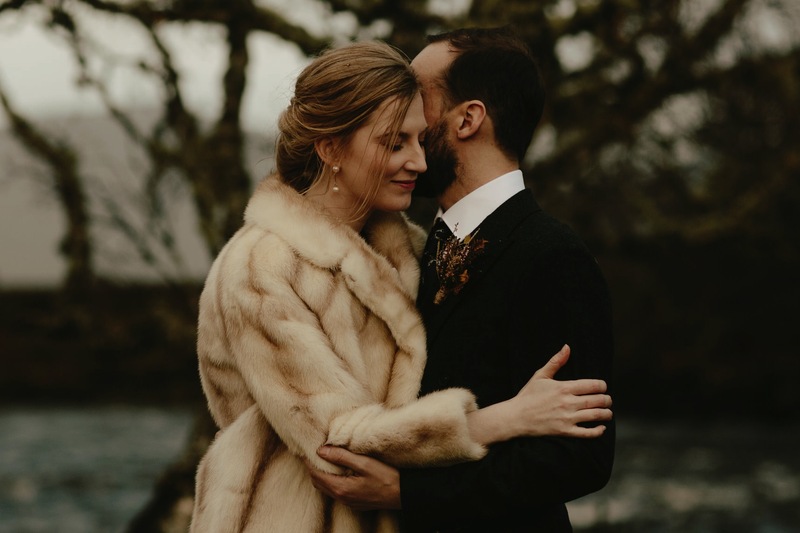 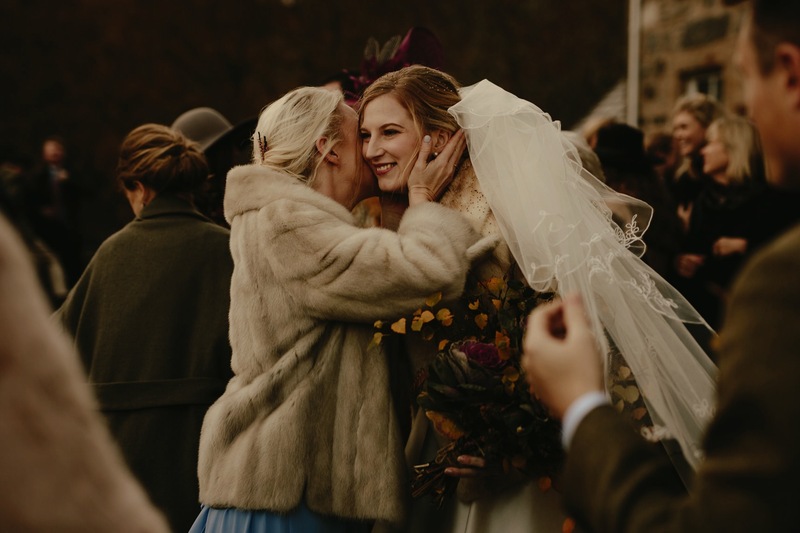 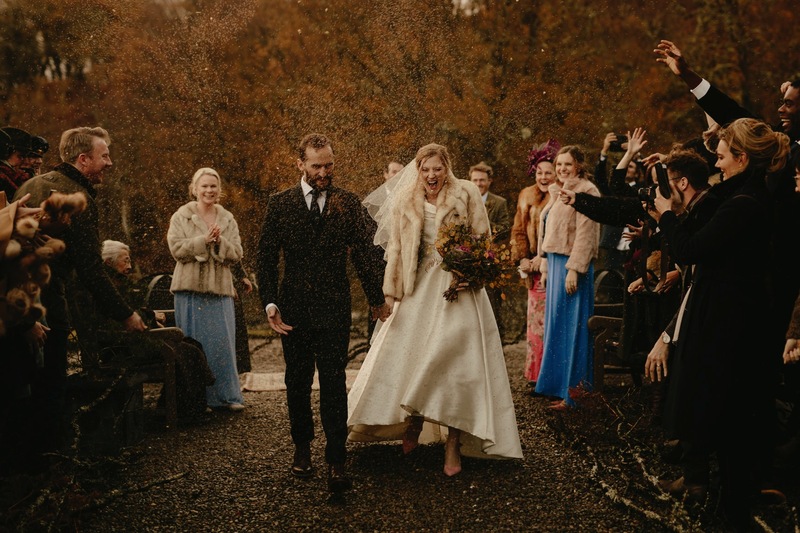 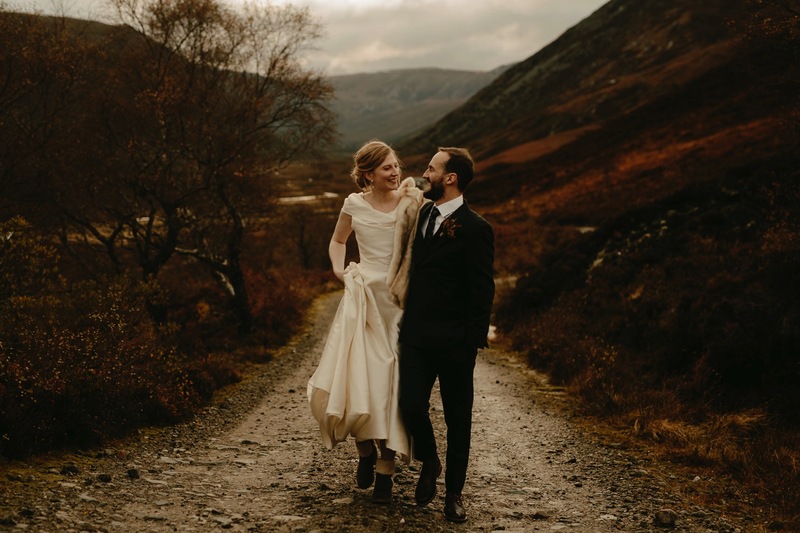 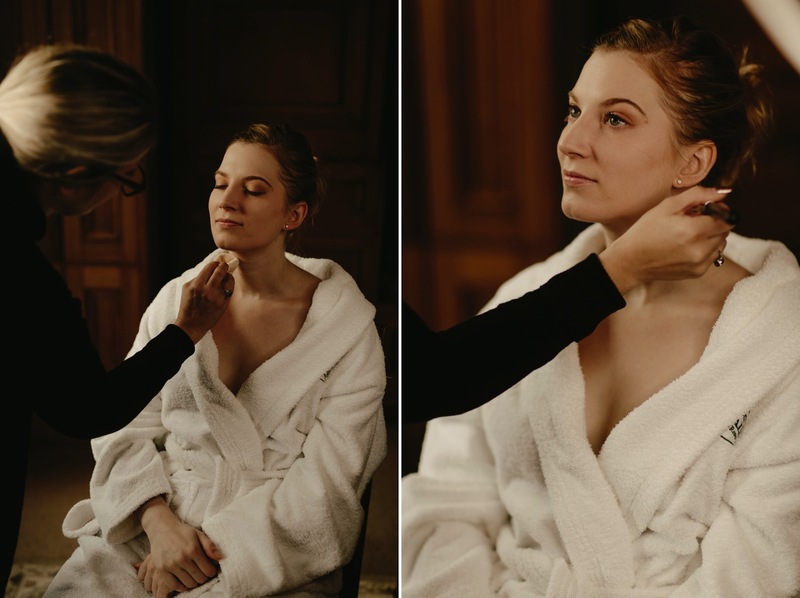 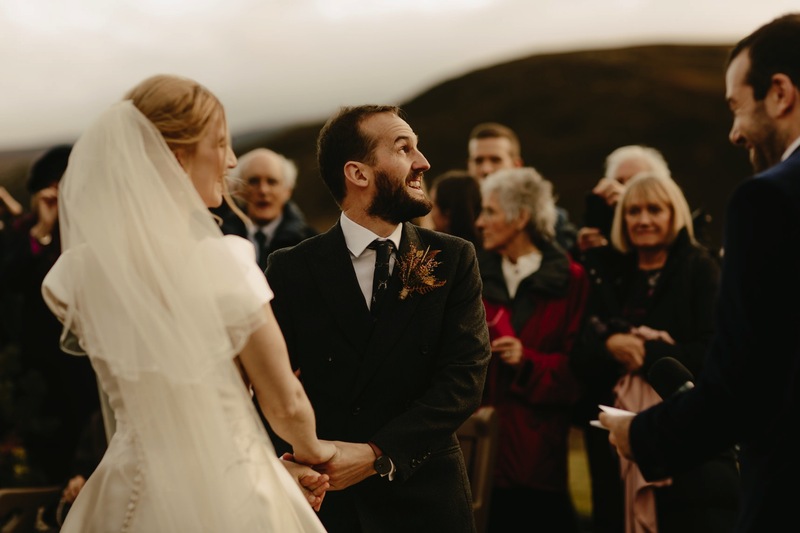 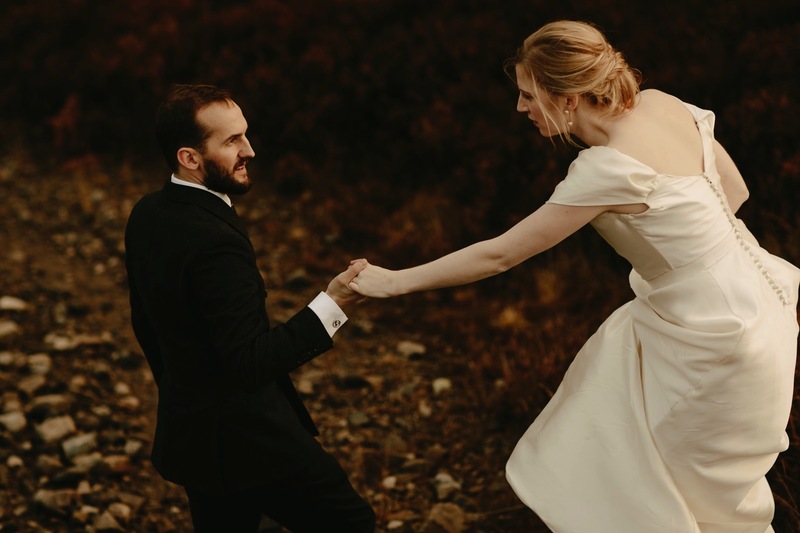 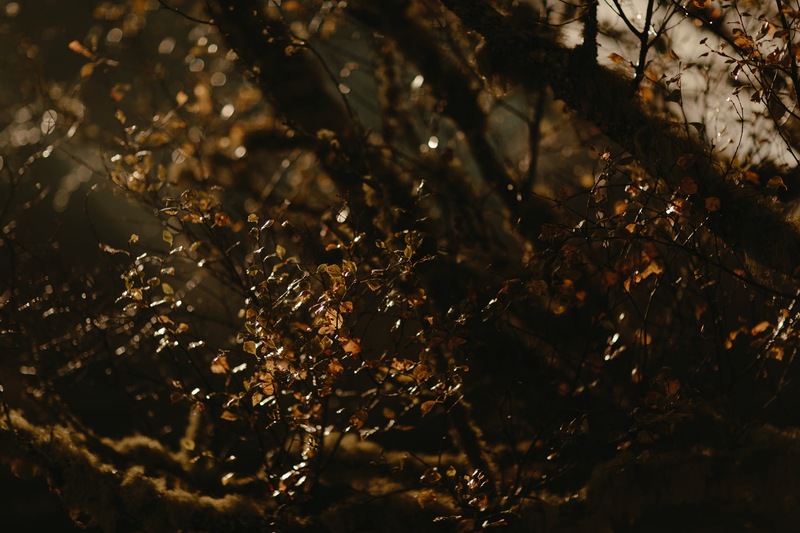 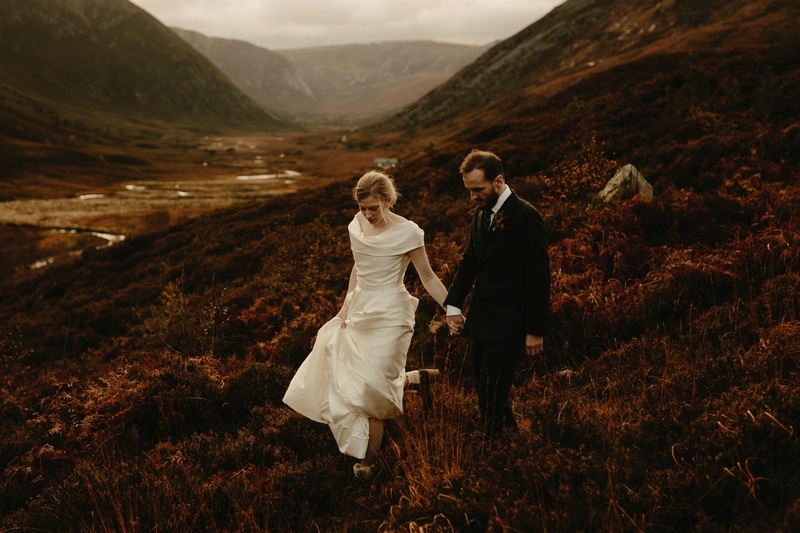 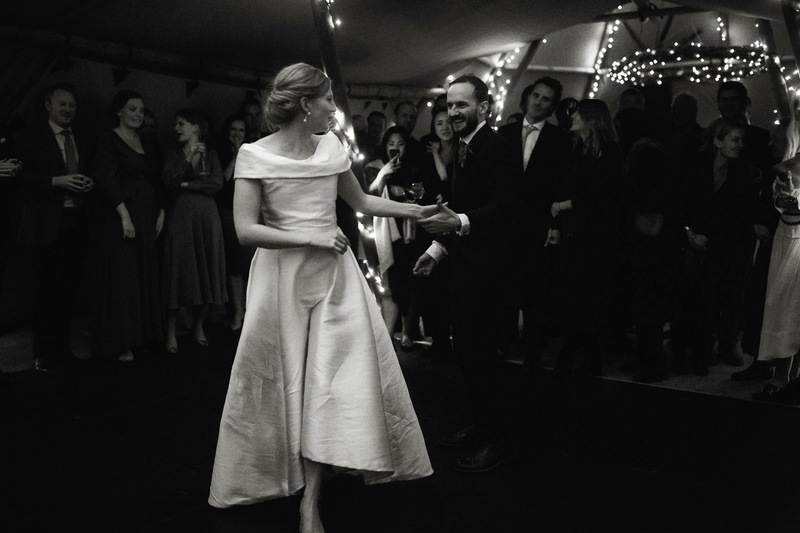 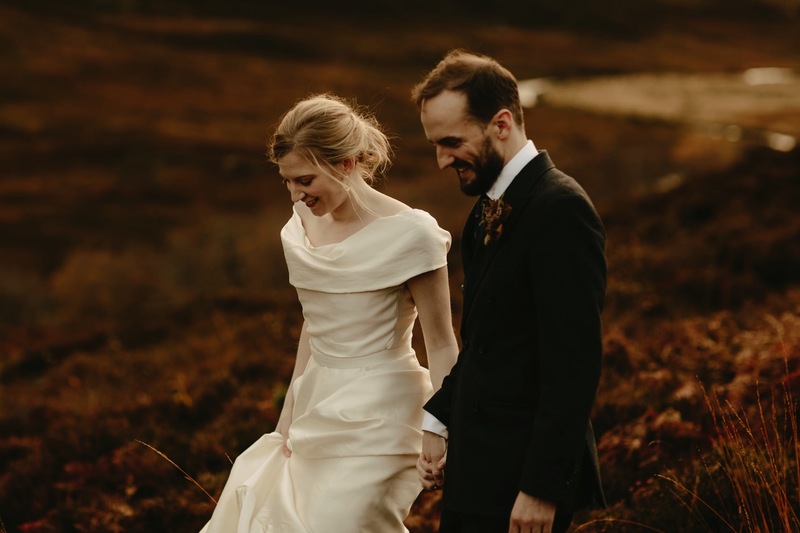 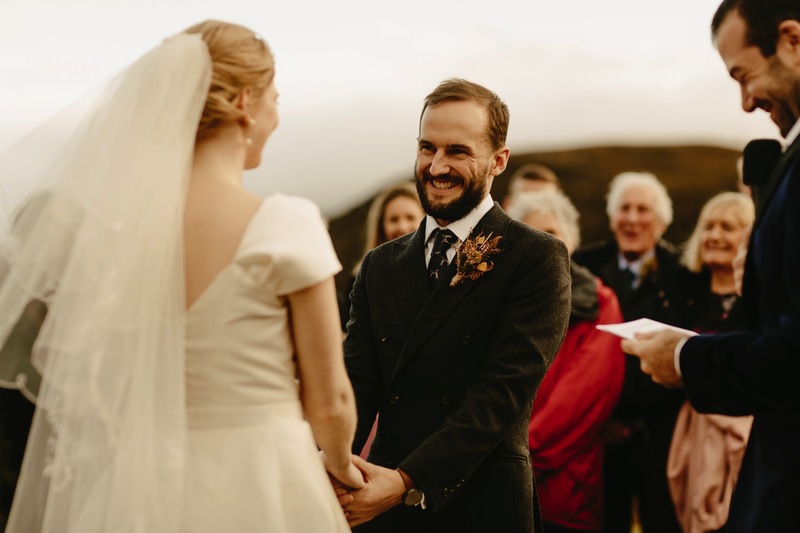 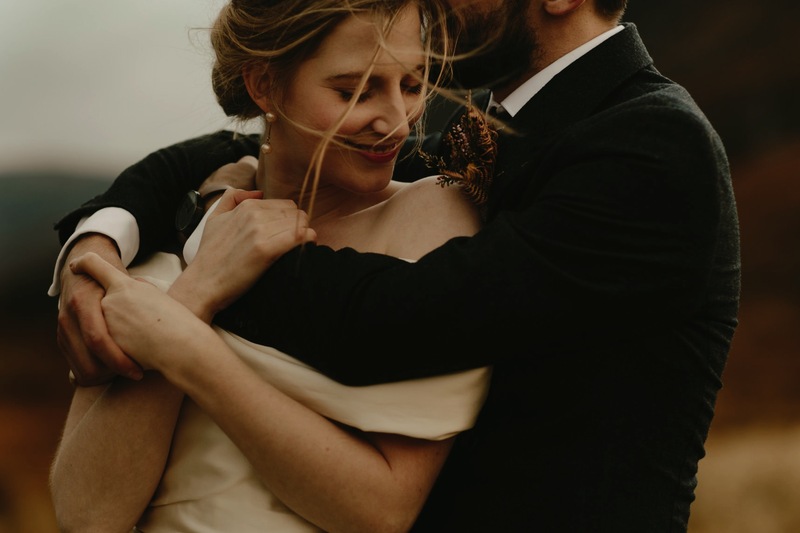 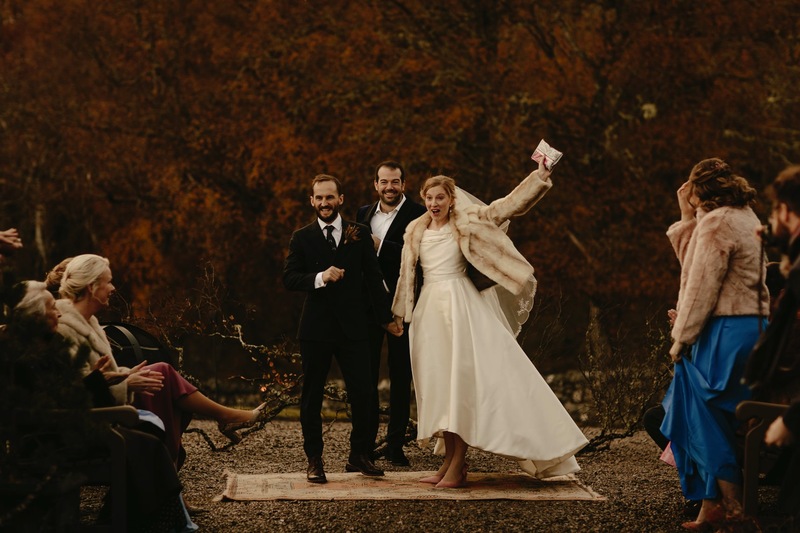 It was an incredible privilege to be a part of this beautiful Scottish Highlands Wedding and to have had so much trust instilled in me to document it all.